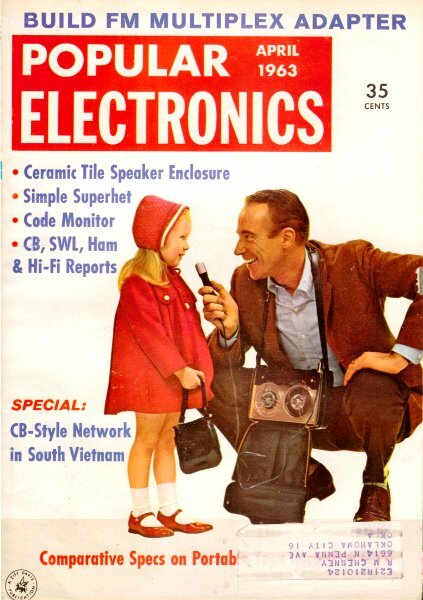 People old and young enjoy waxing nostalgic about and learning some of the history of early electronics. 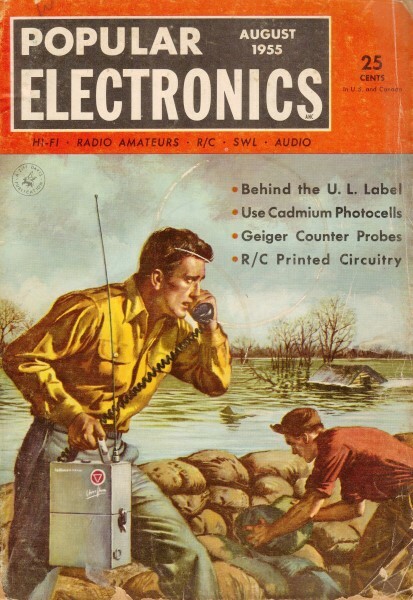 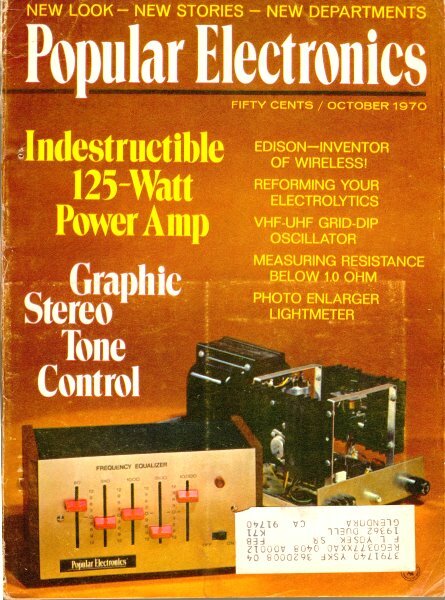 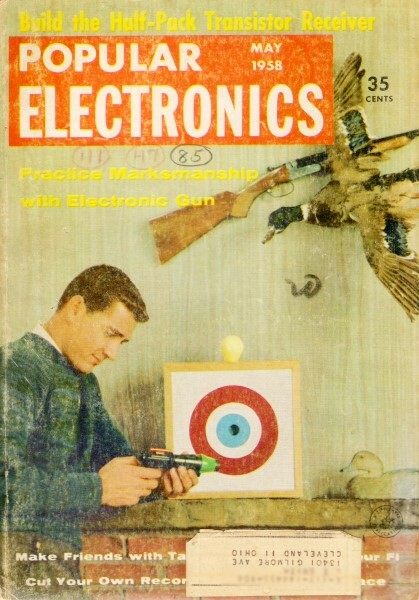 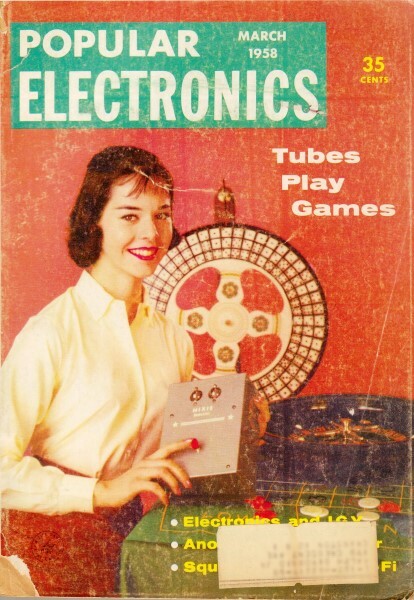 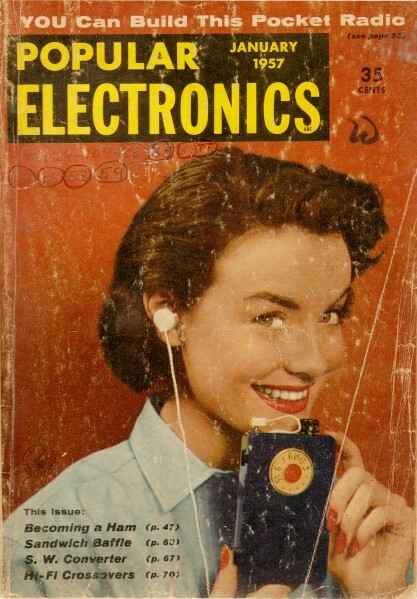 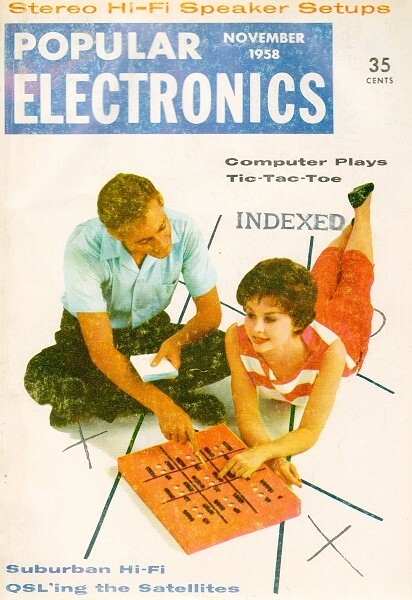 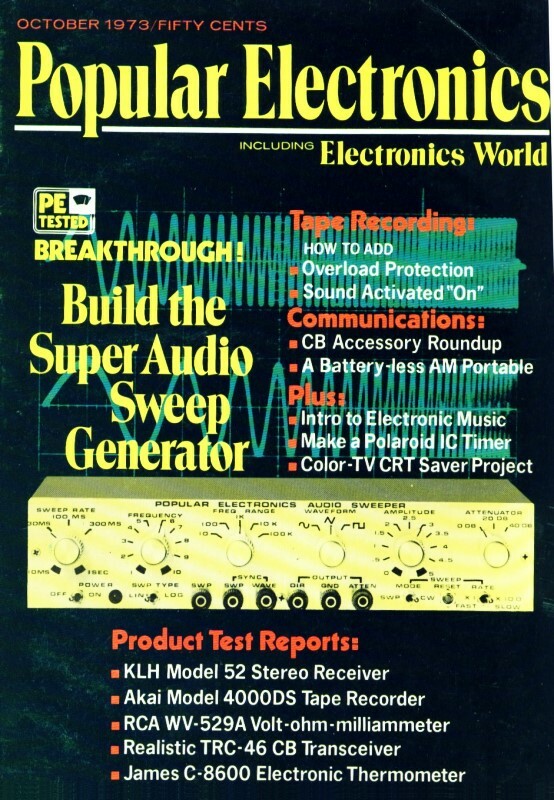 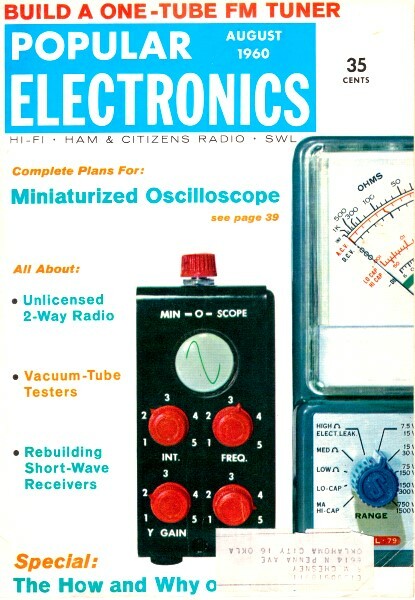 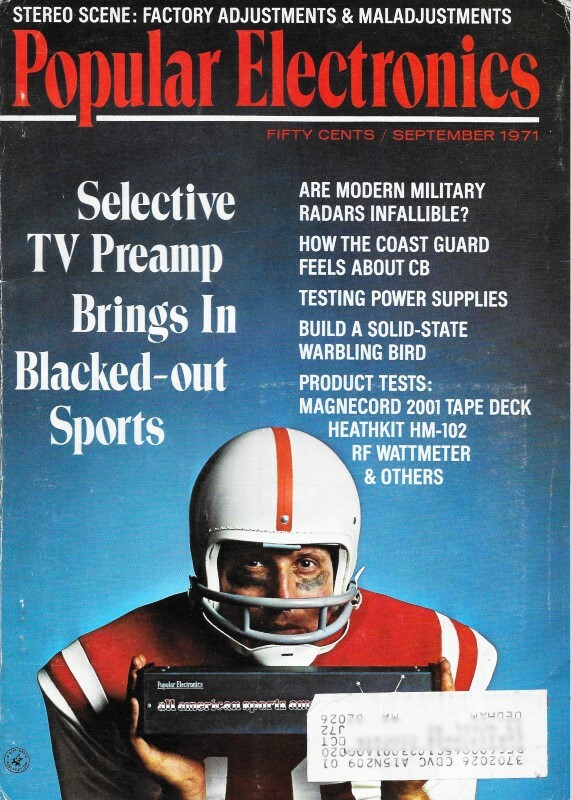 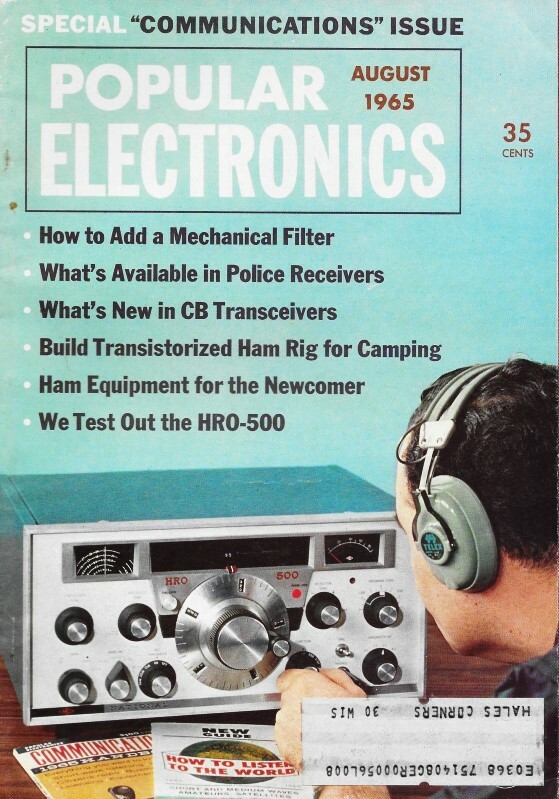 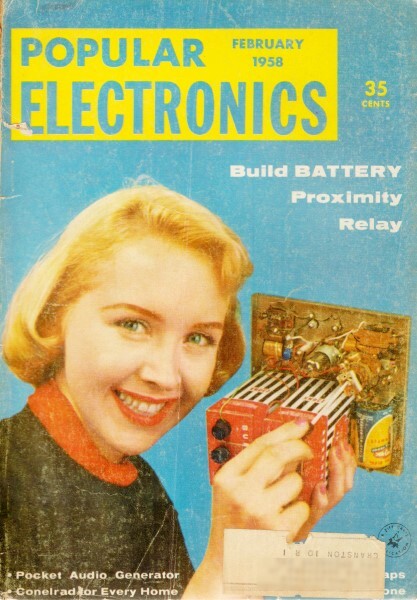 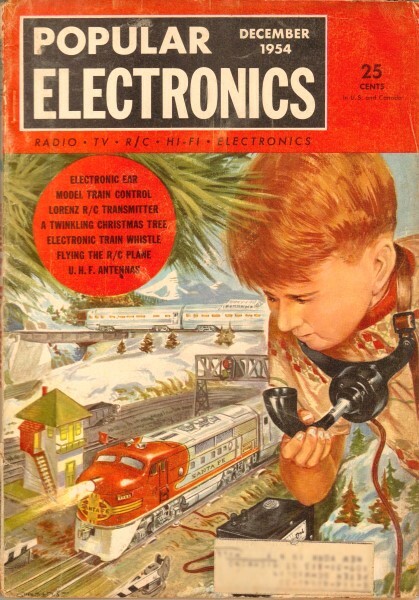 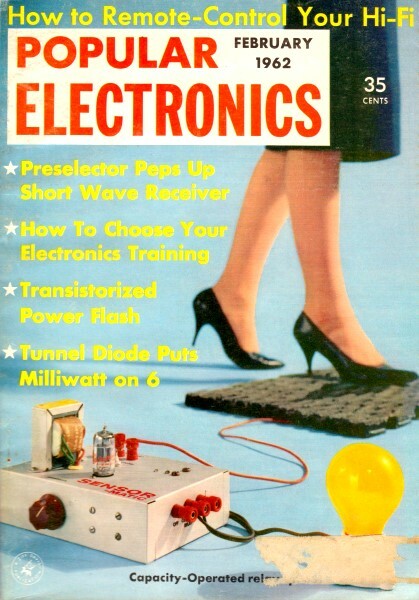 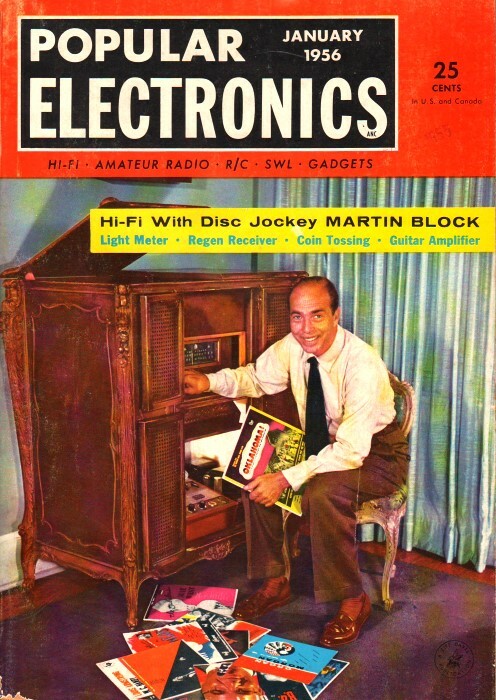 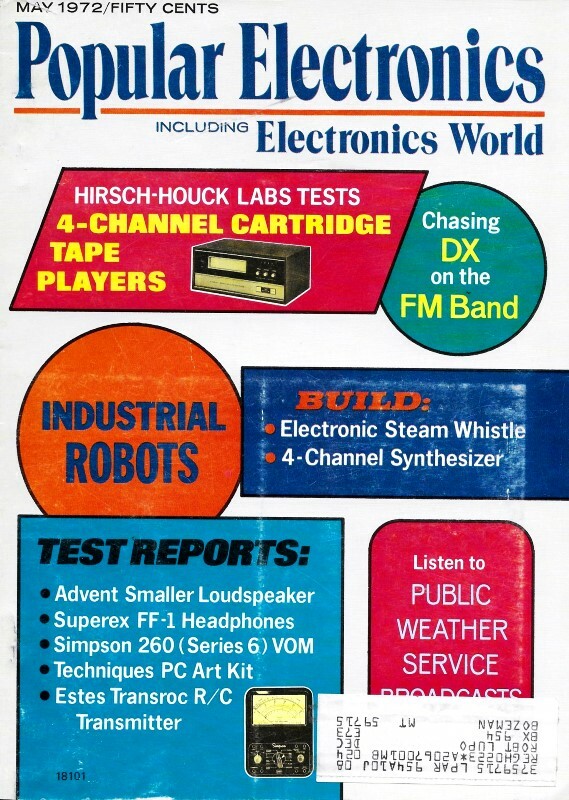 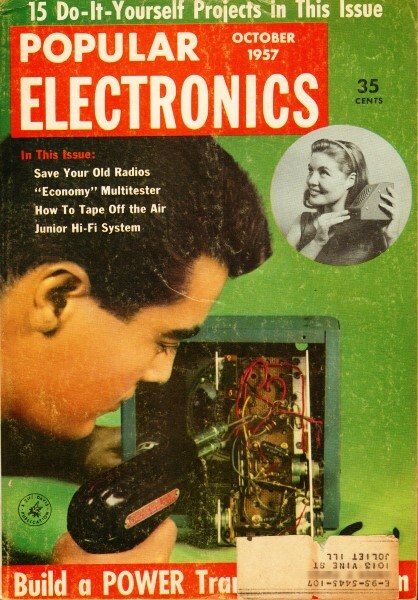 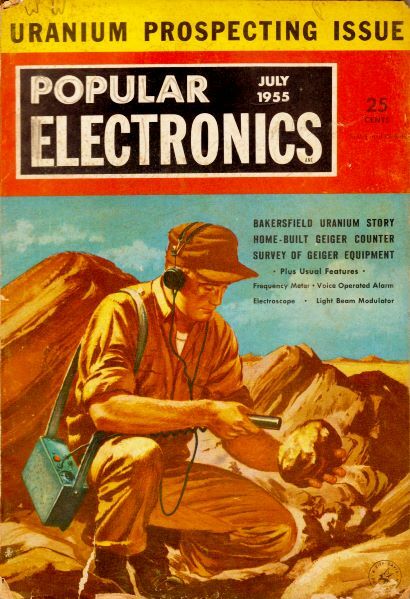 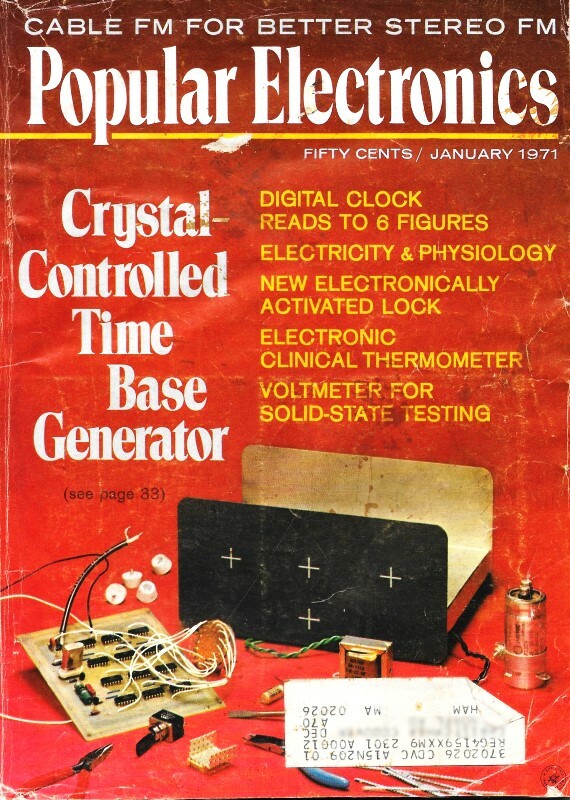 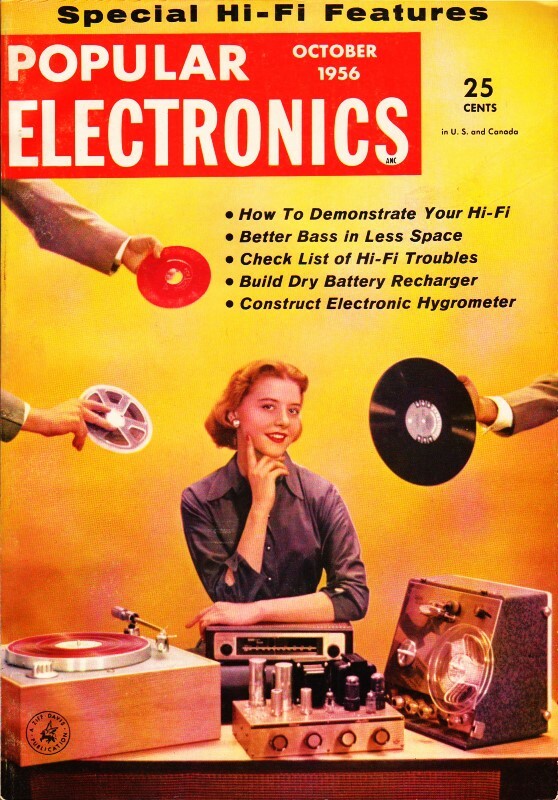 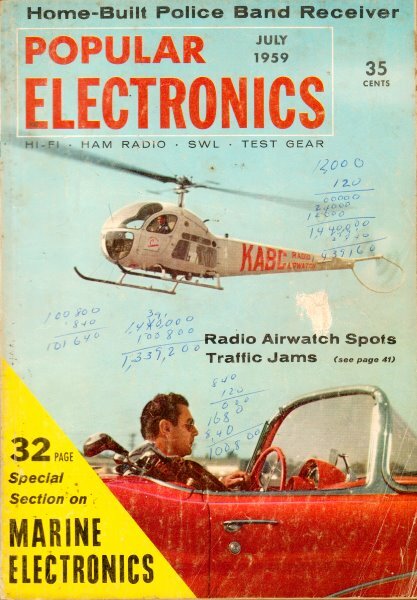 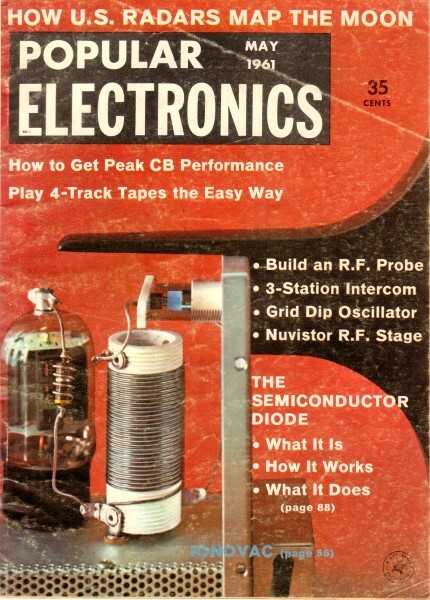 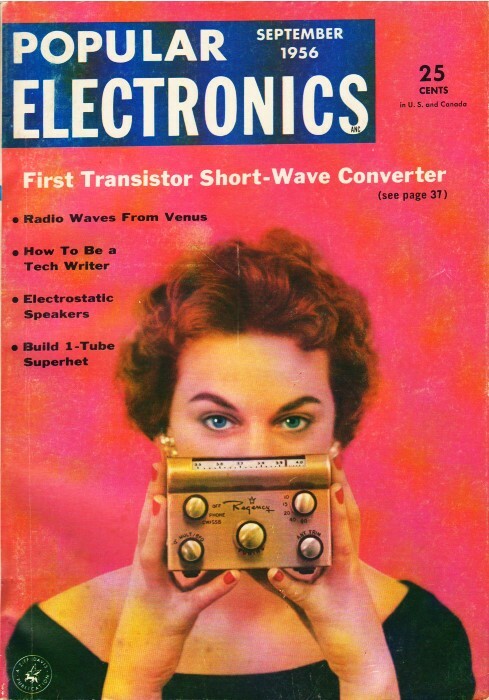 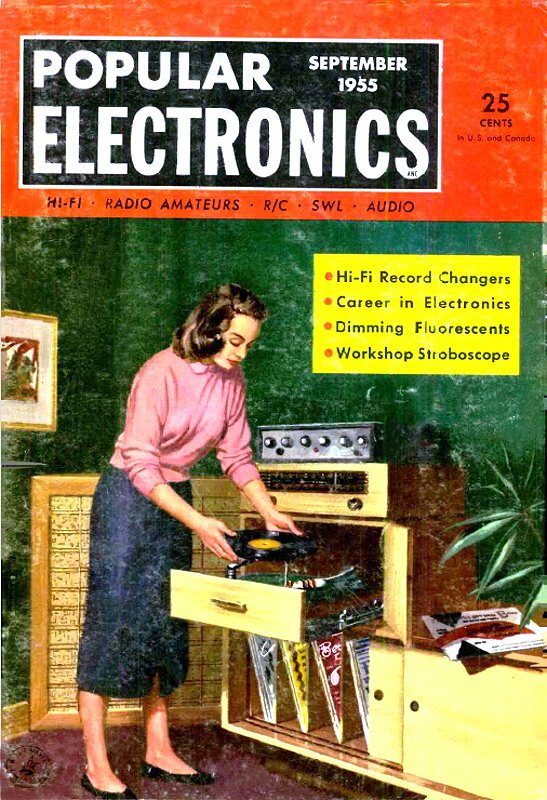 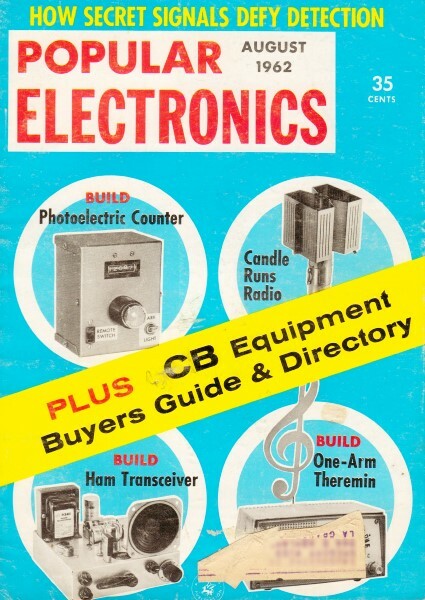 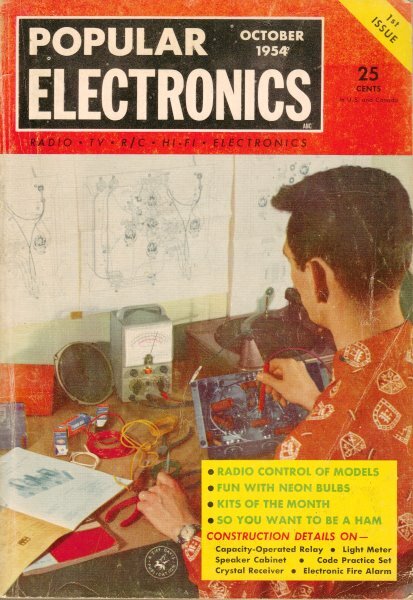 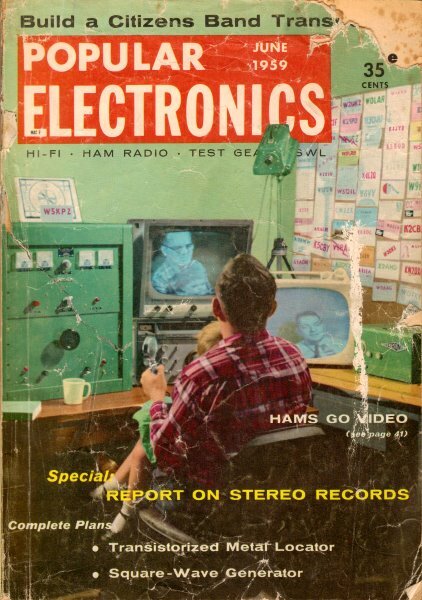 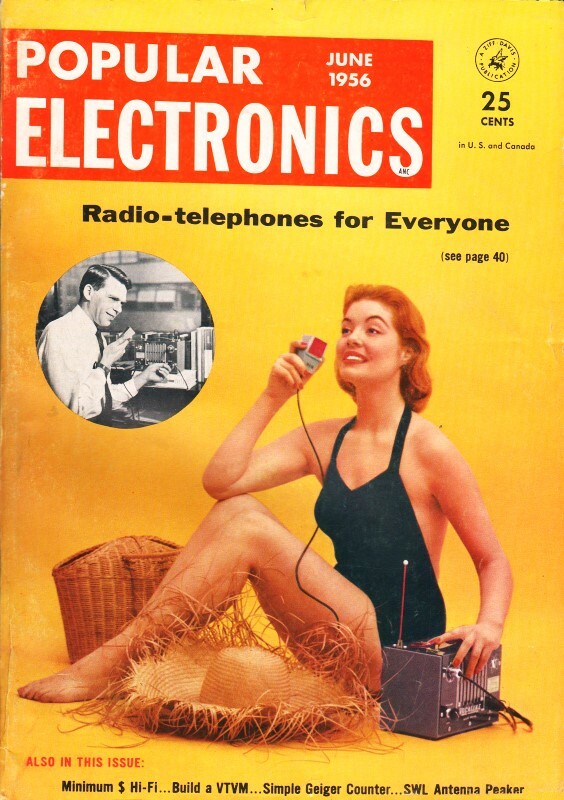 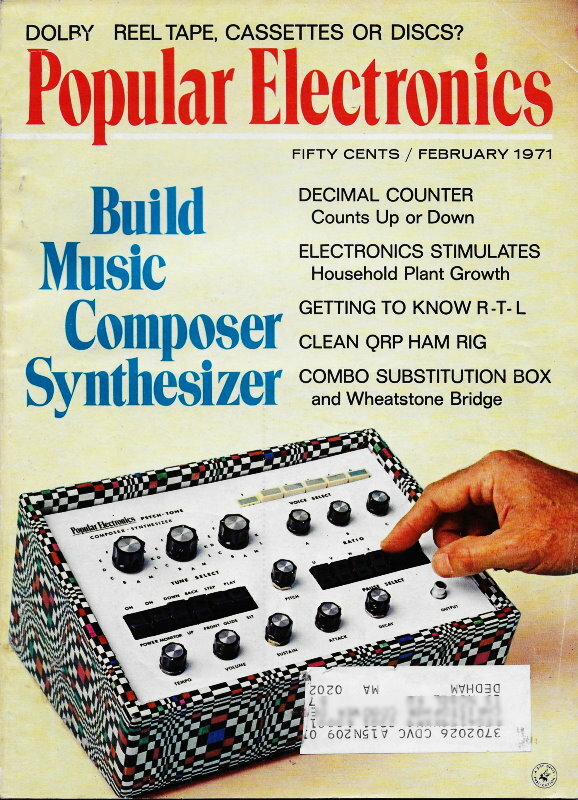 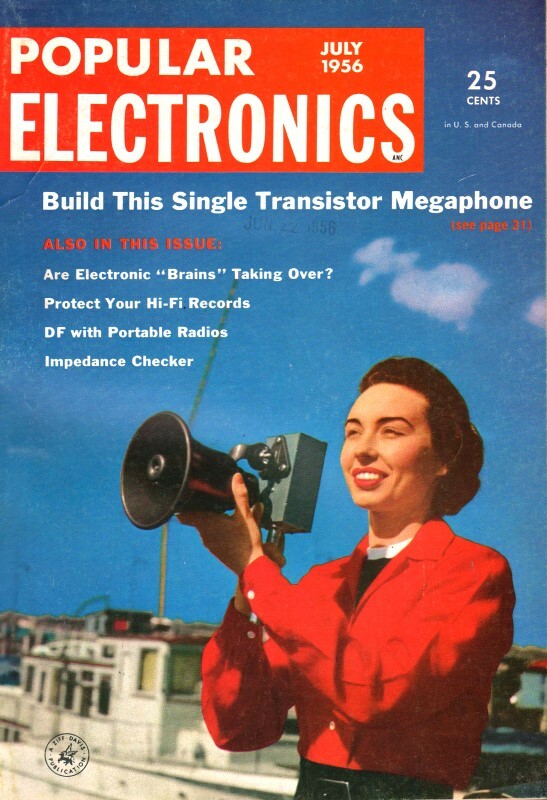 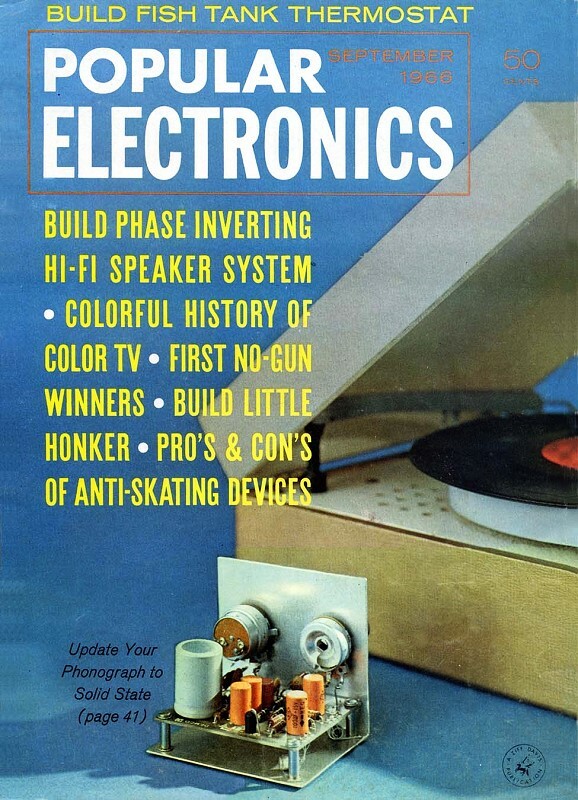 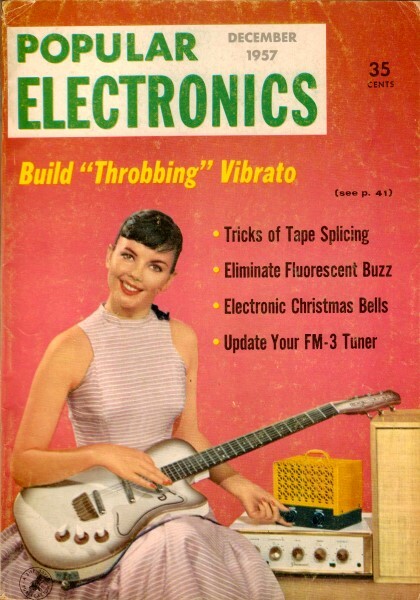 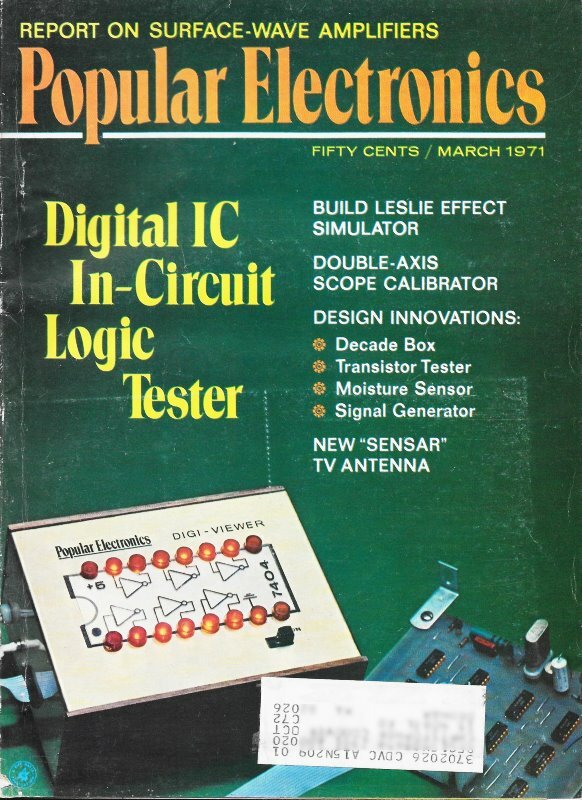 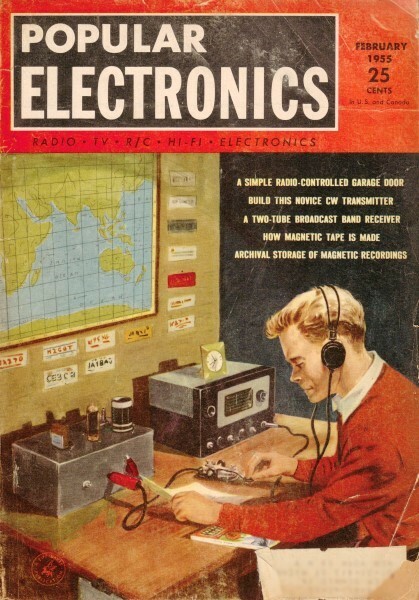 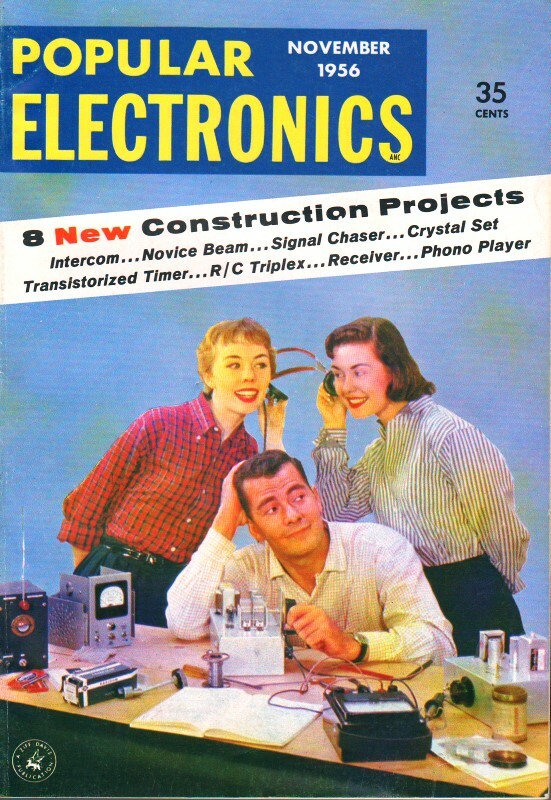 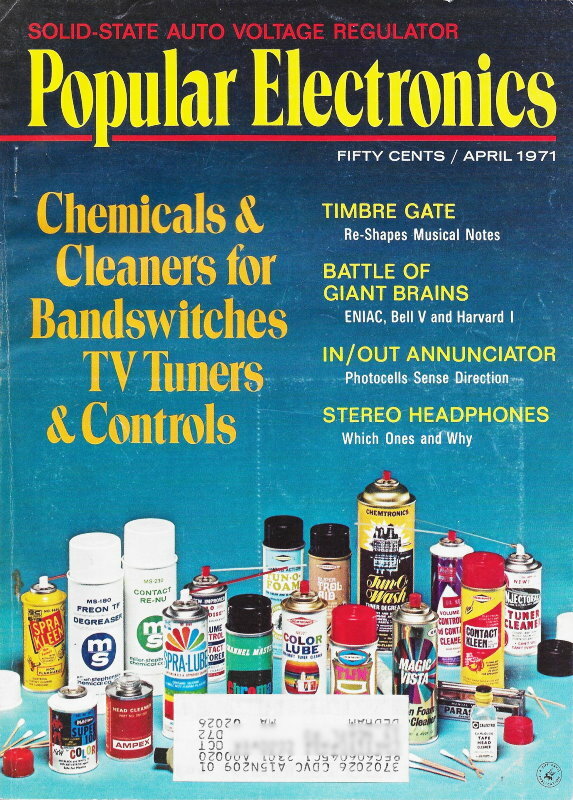 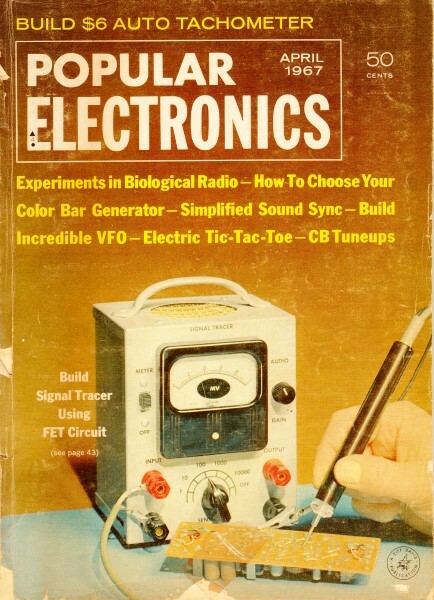 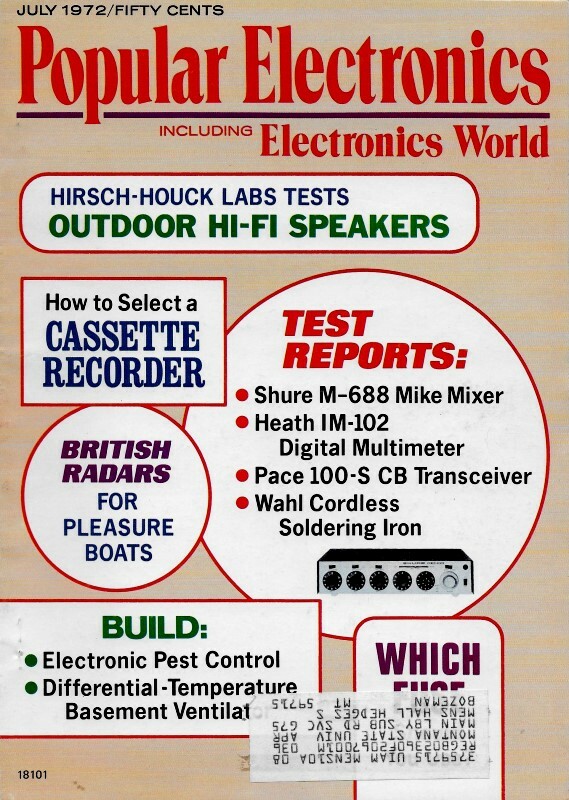 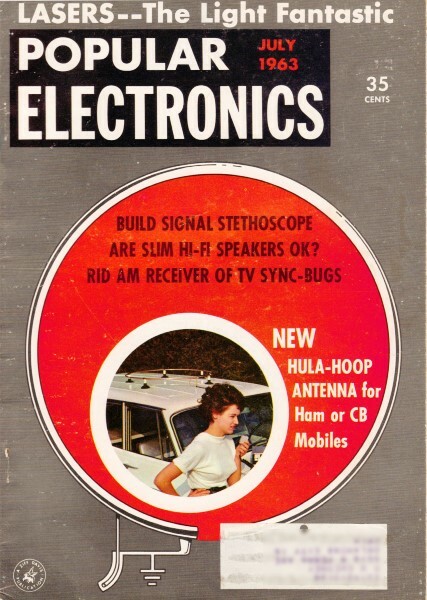 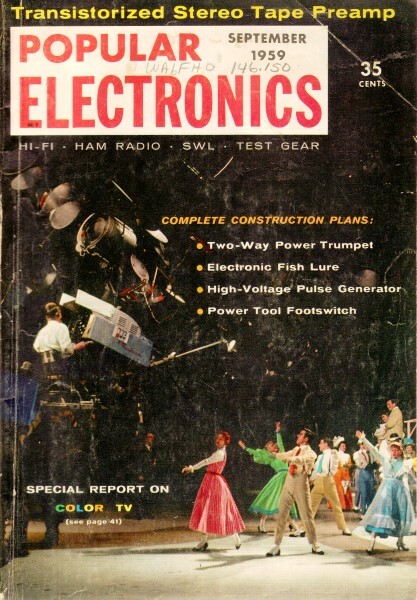 Popular Electronics was published from October 1954 through April 1985. 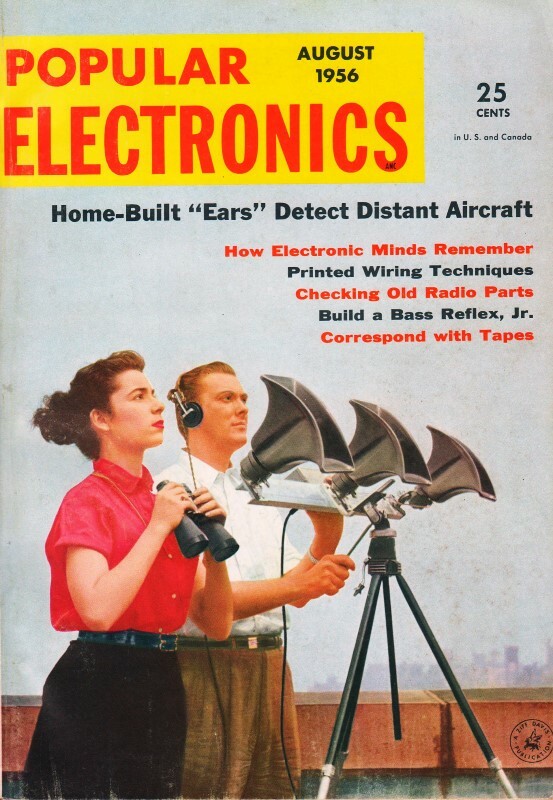 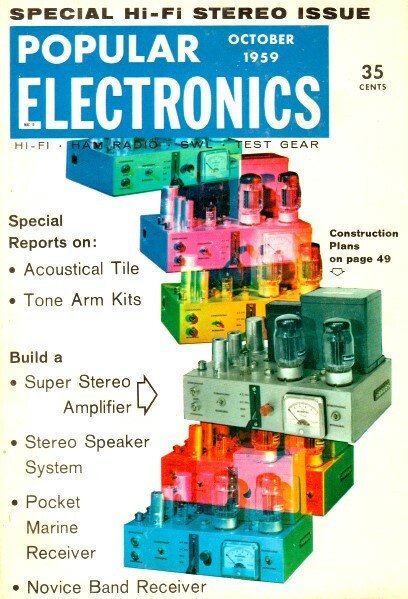 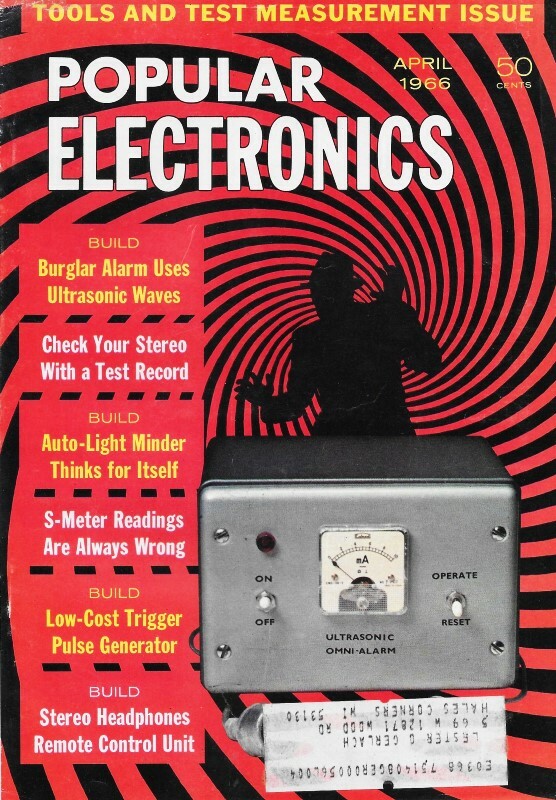 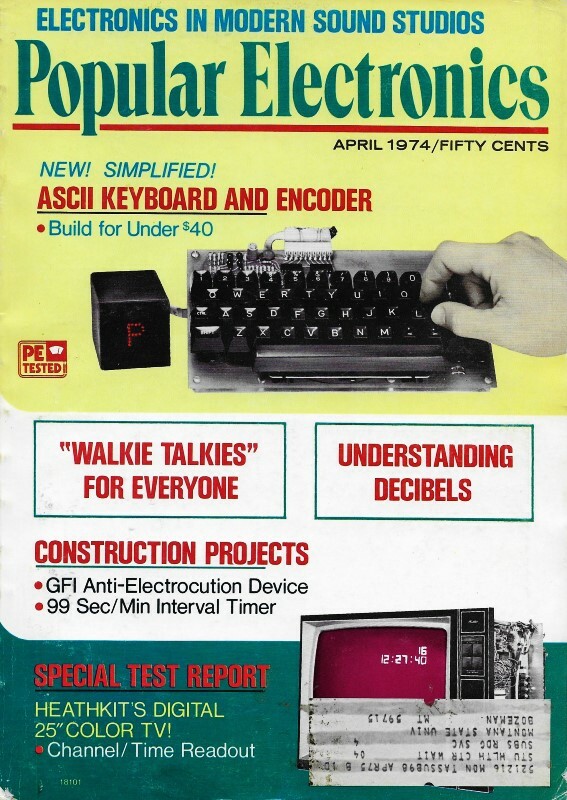 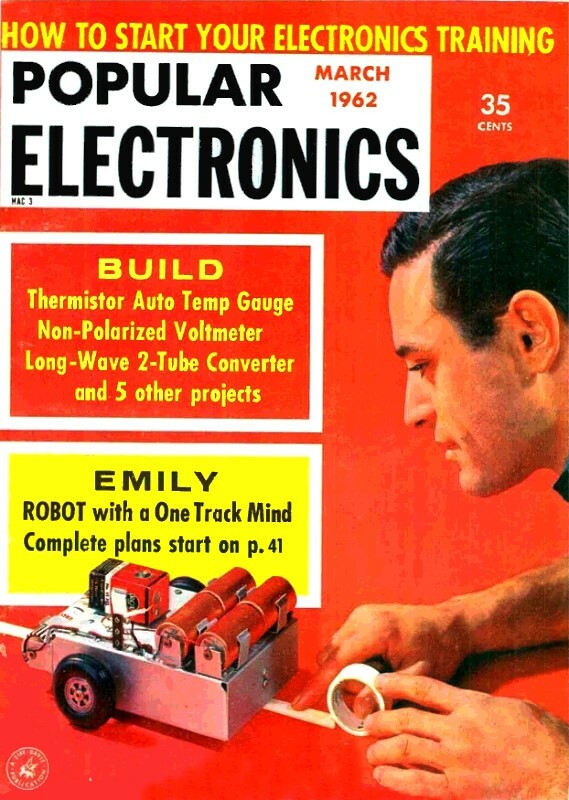 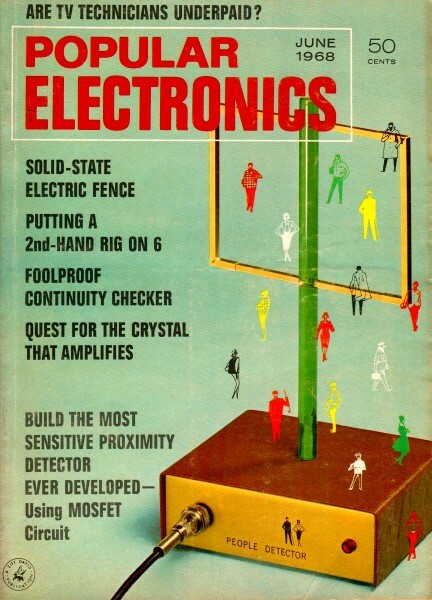 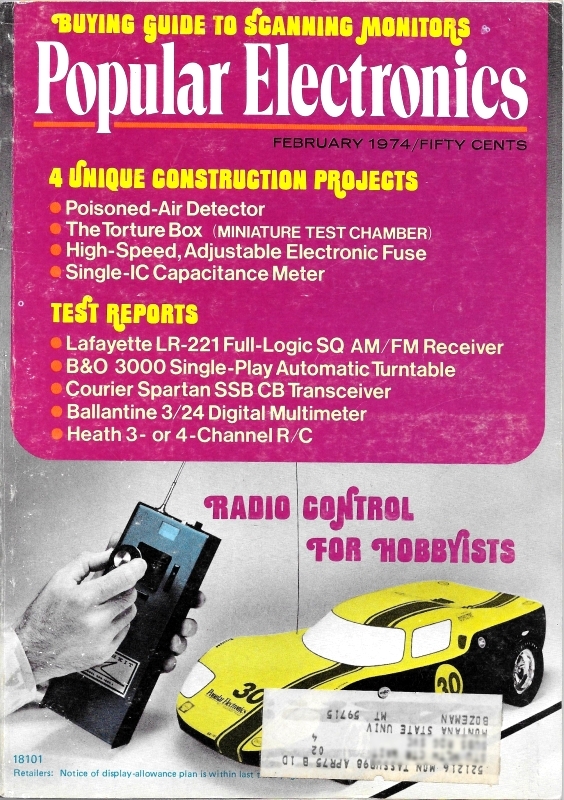 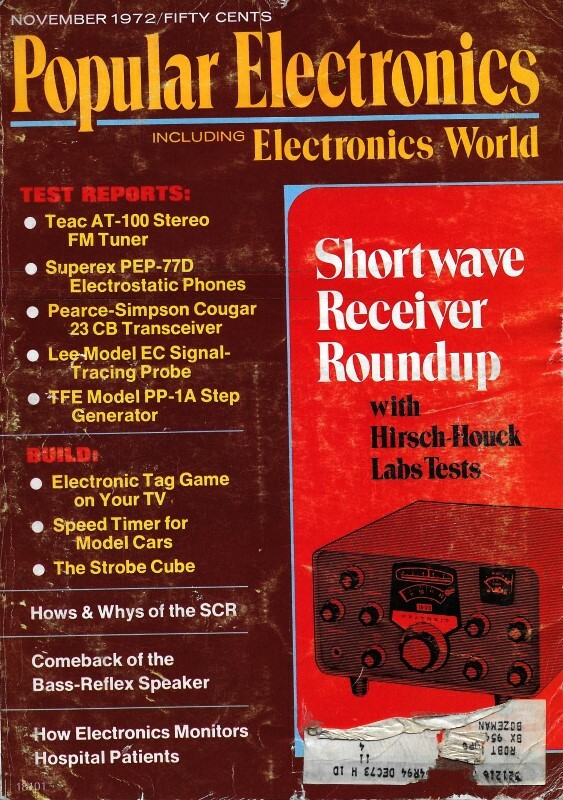 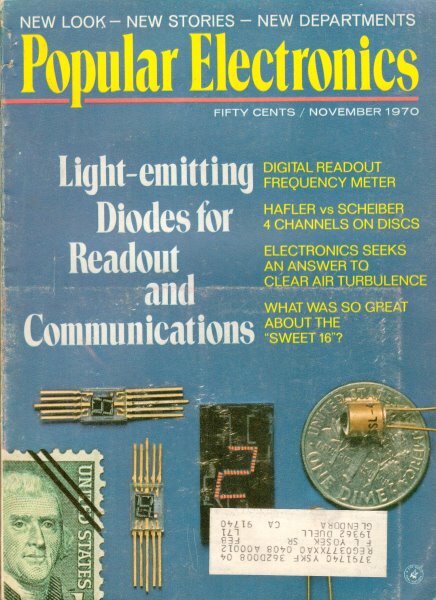 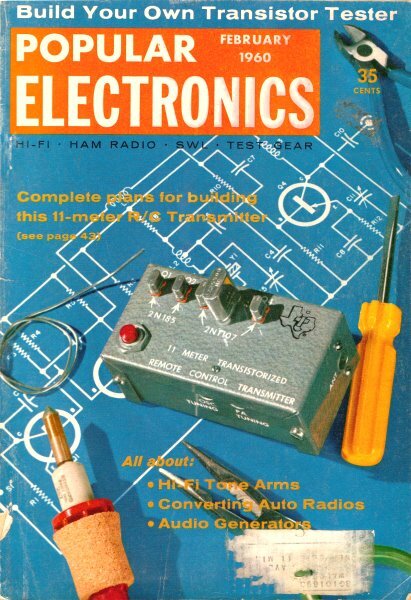 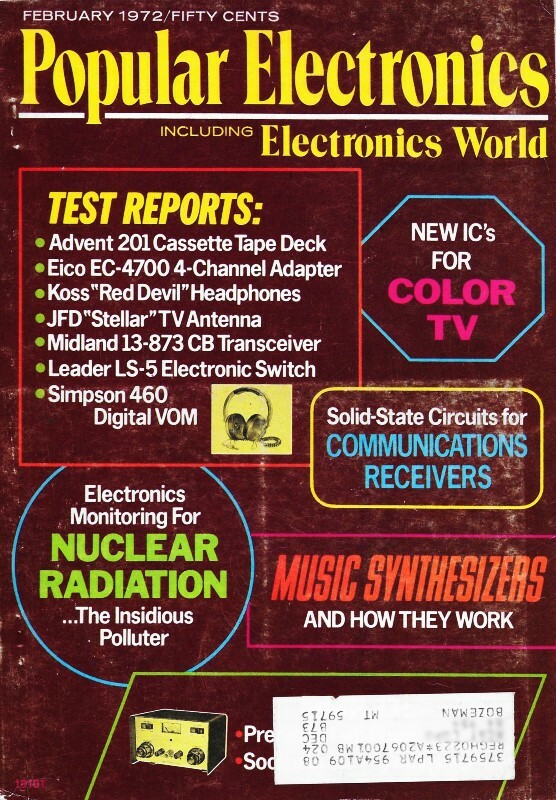 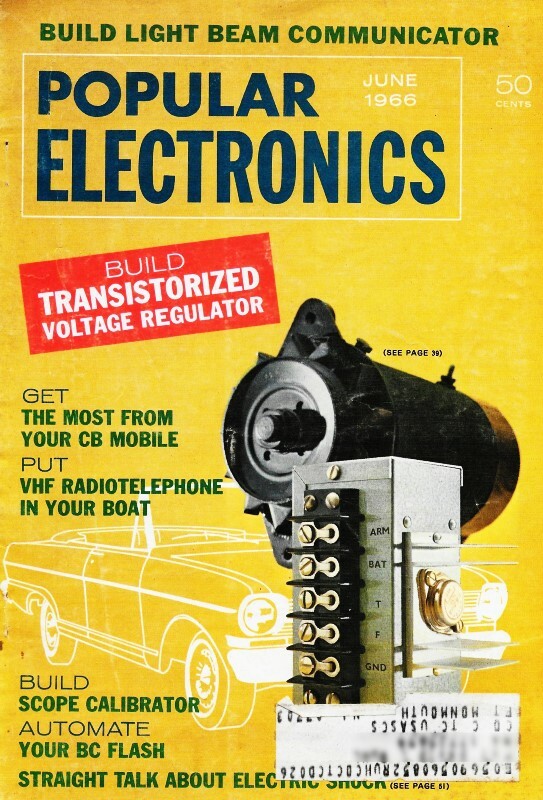 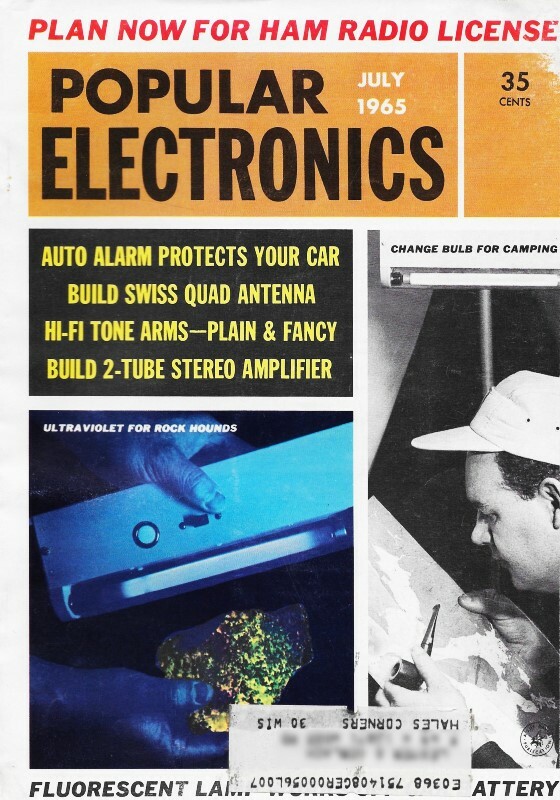 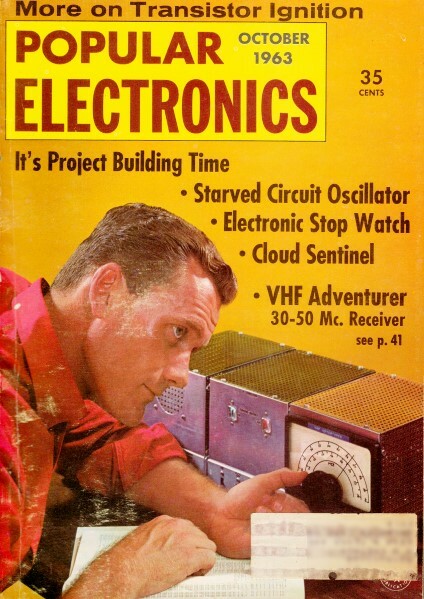 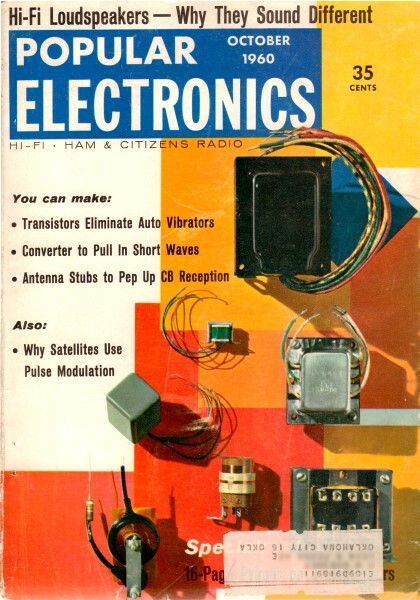 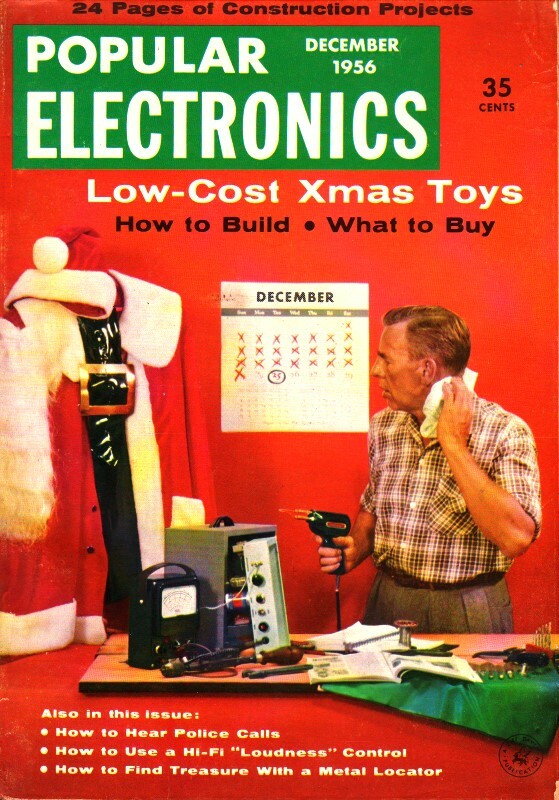 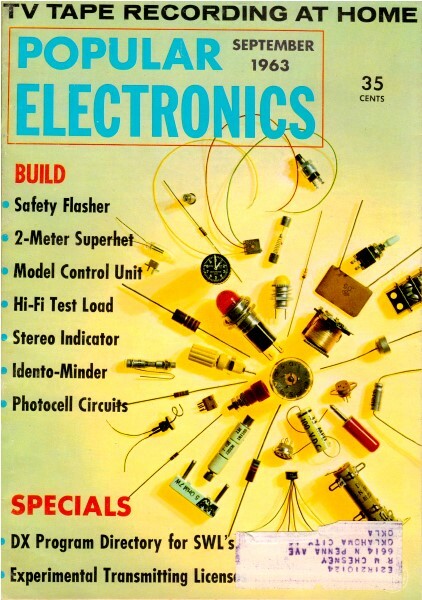 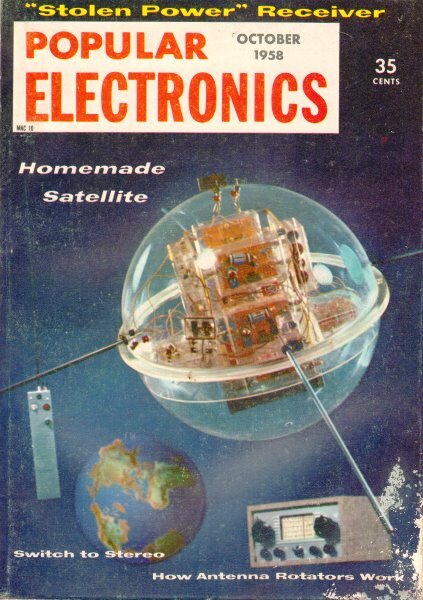 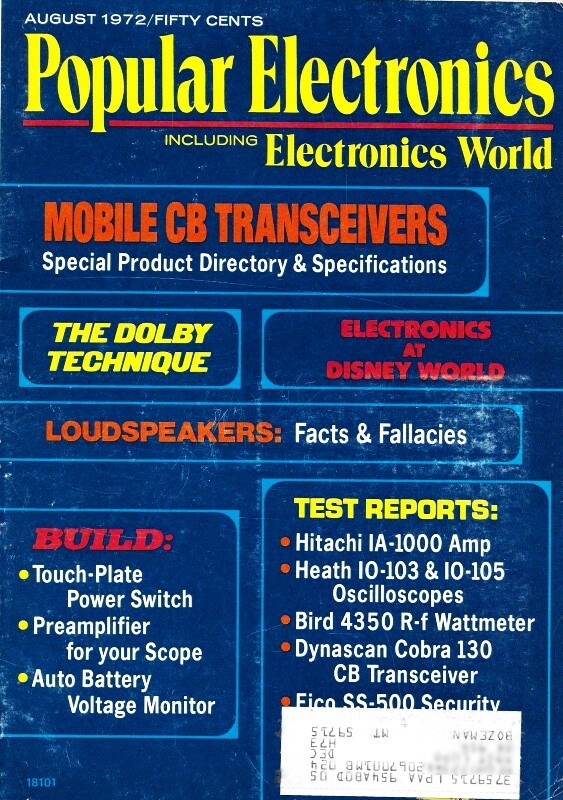 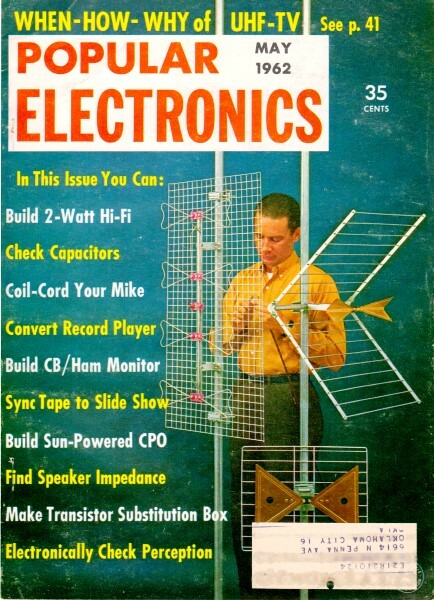 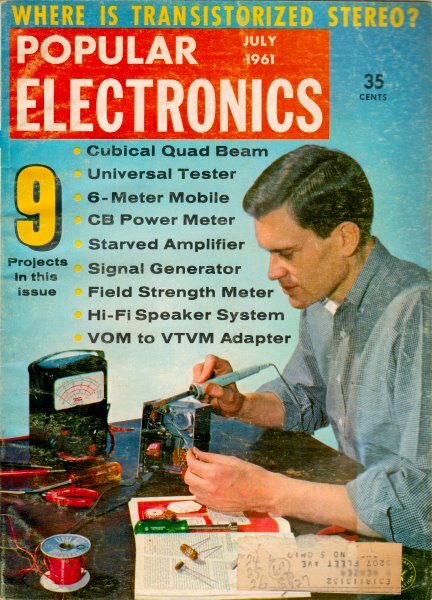 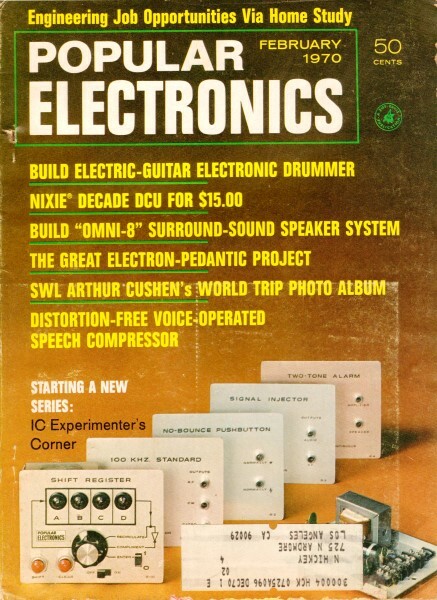 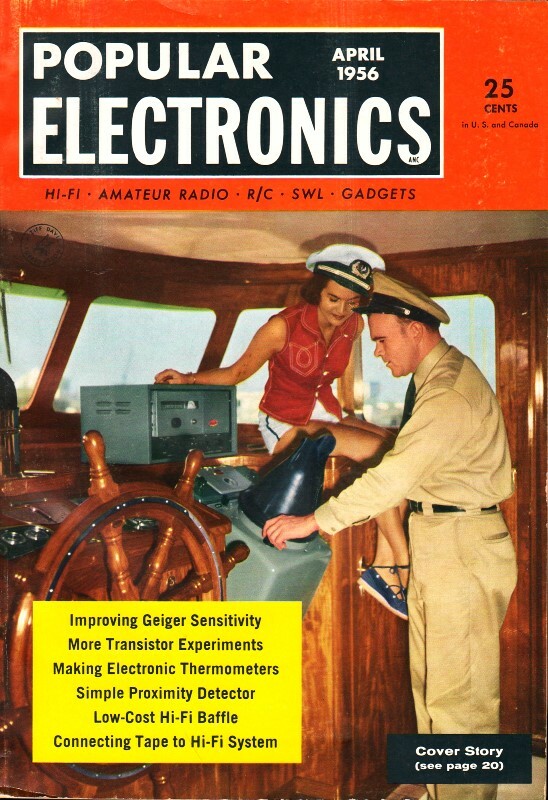 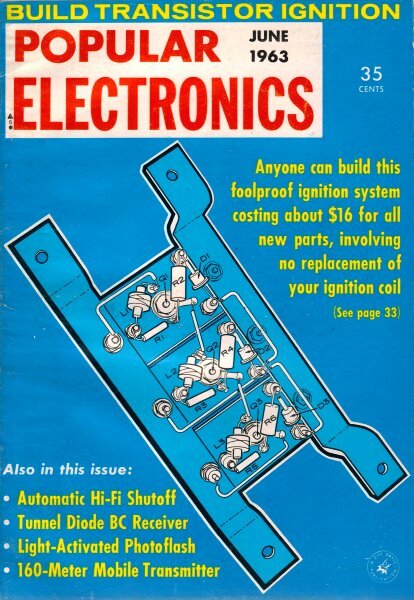 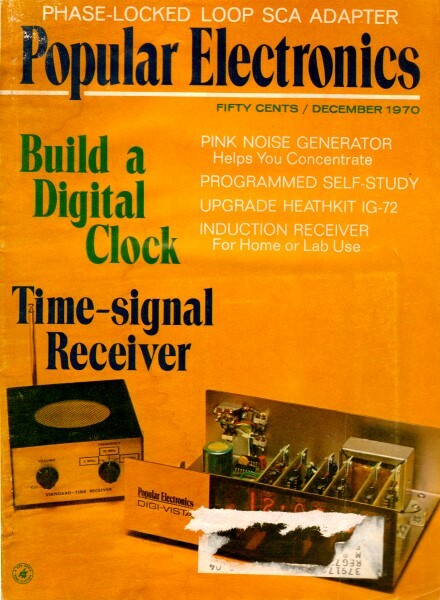 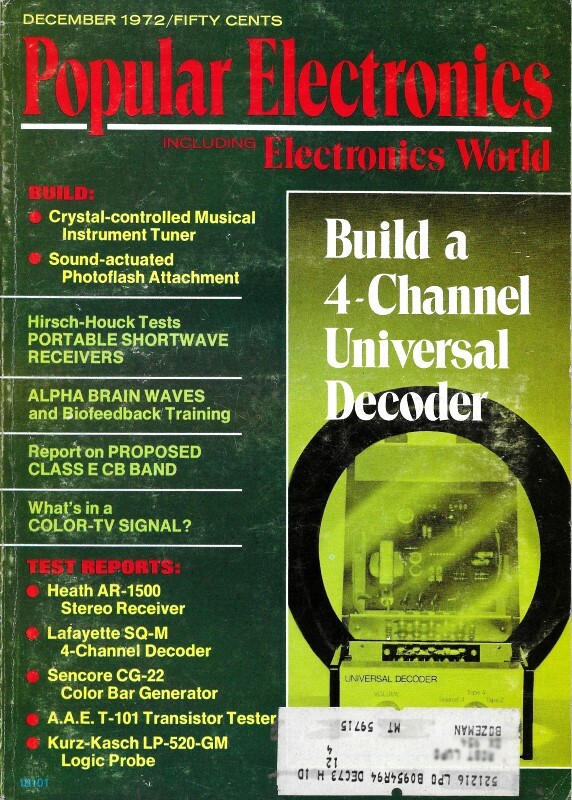 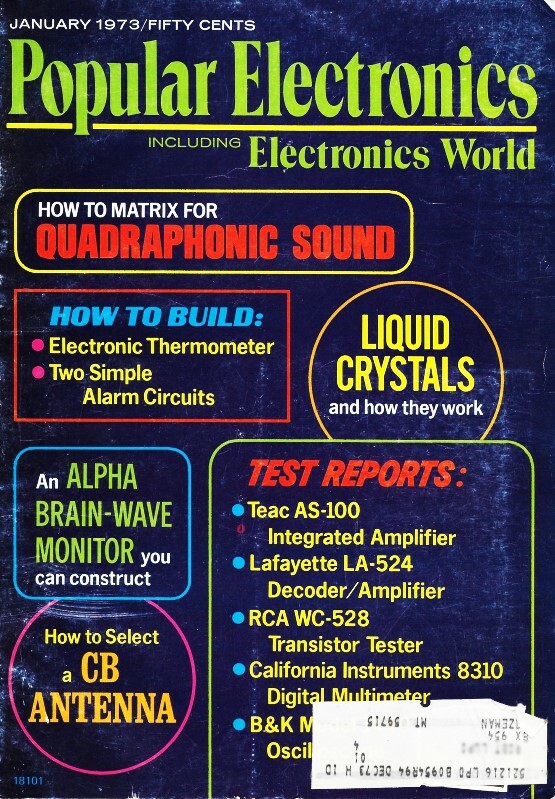 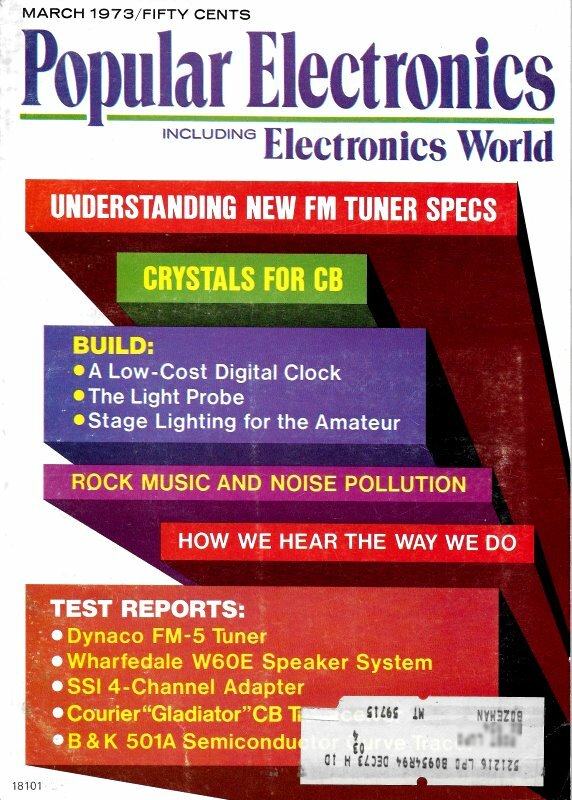 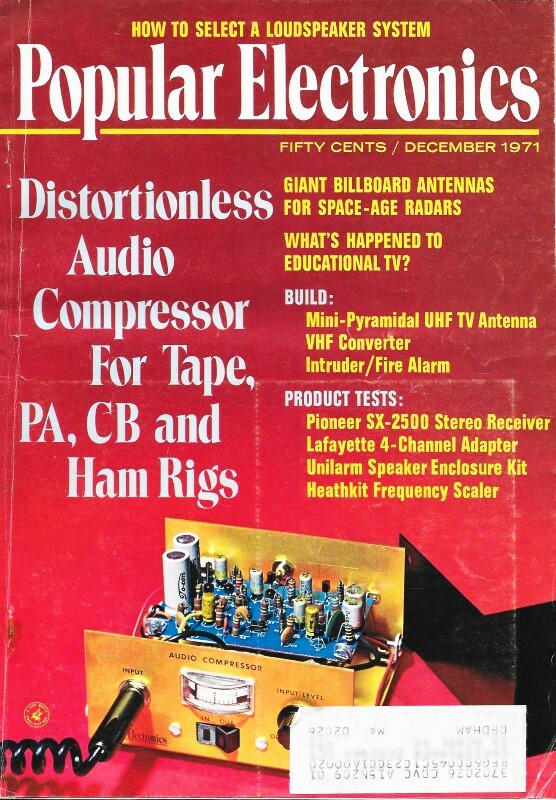 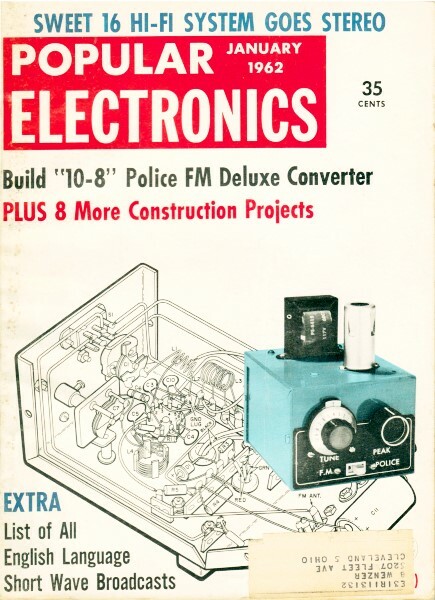 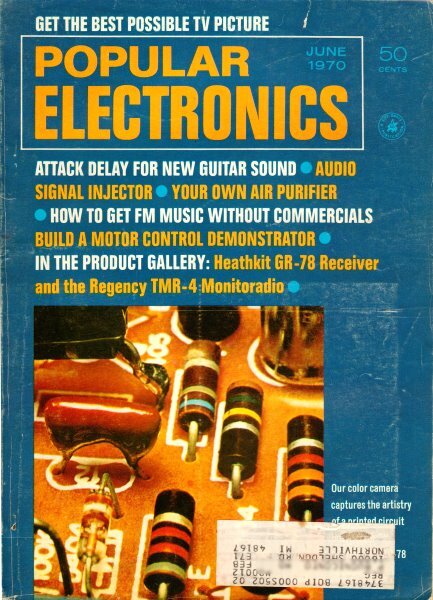 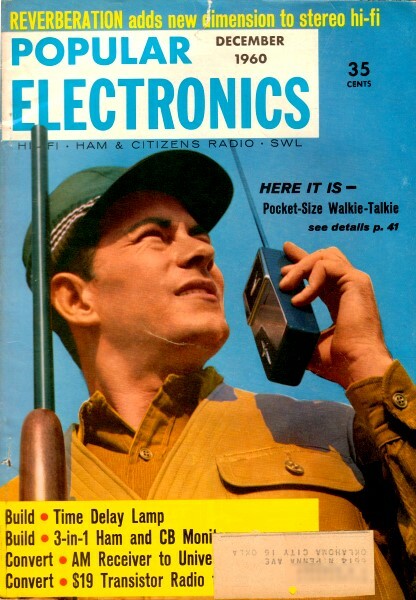 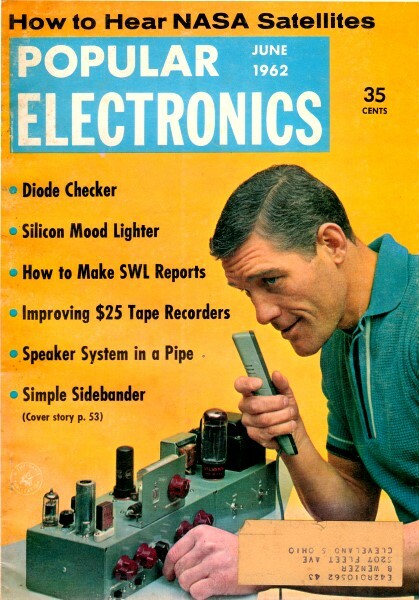 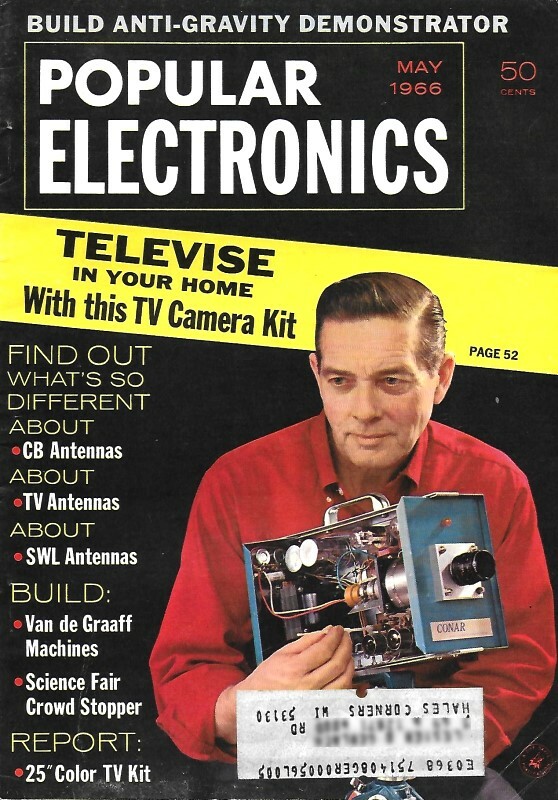 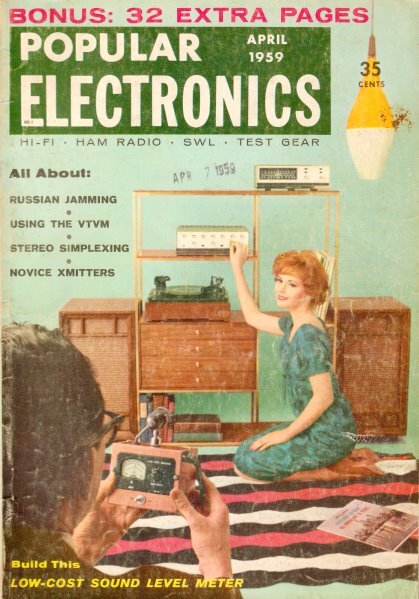 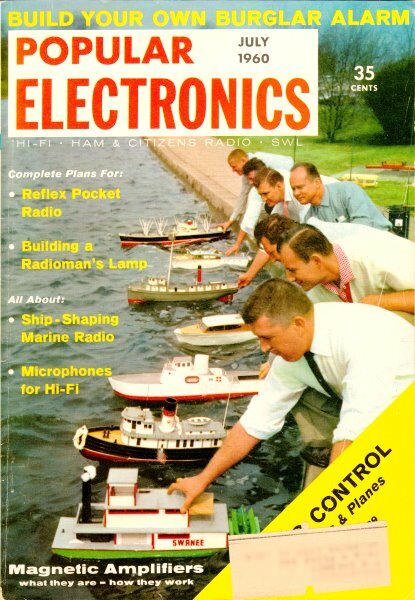 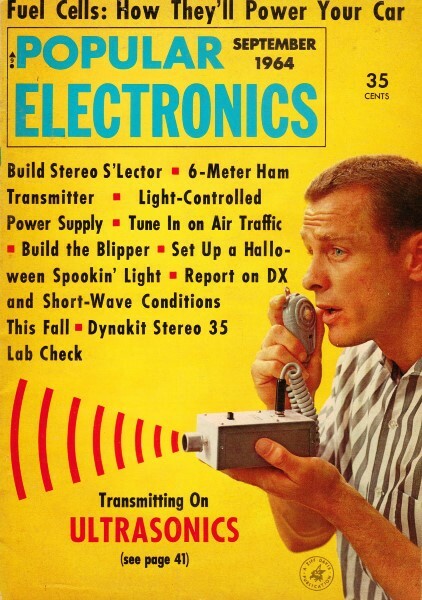 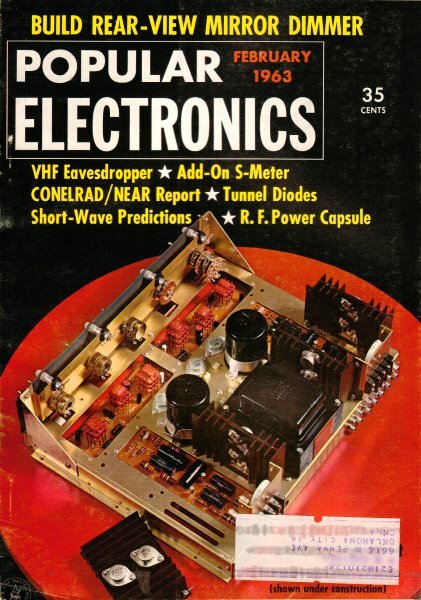 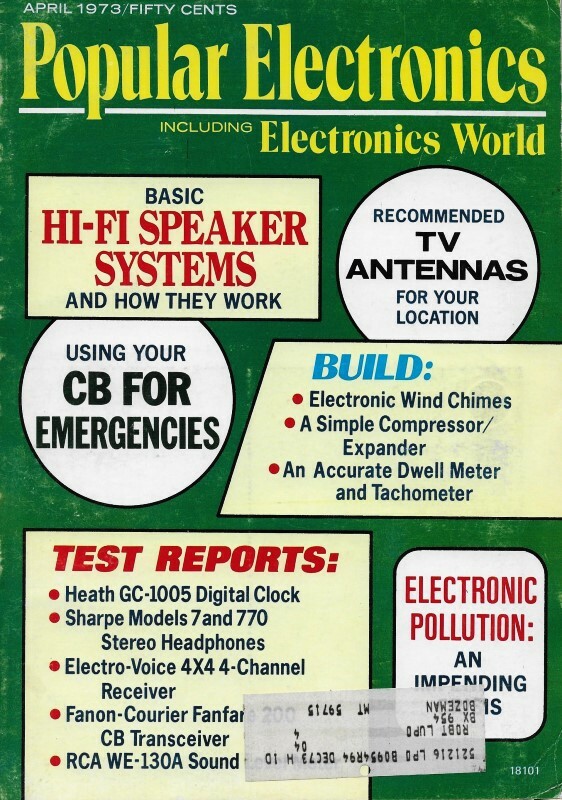 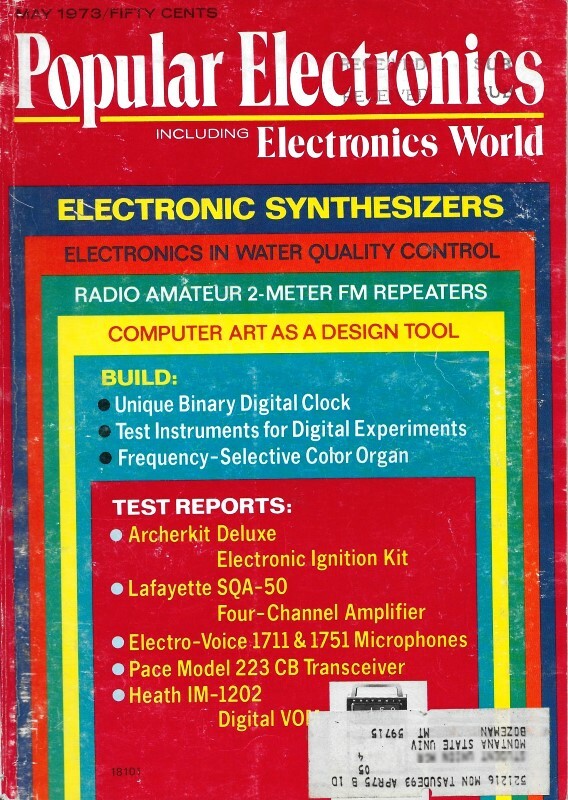 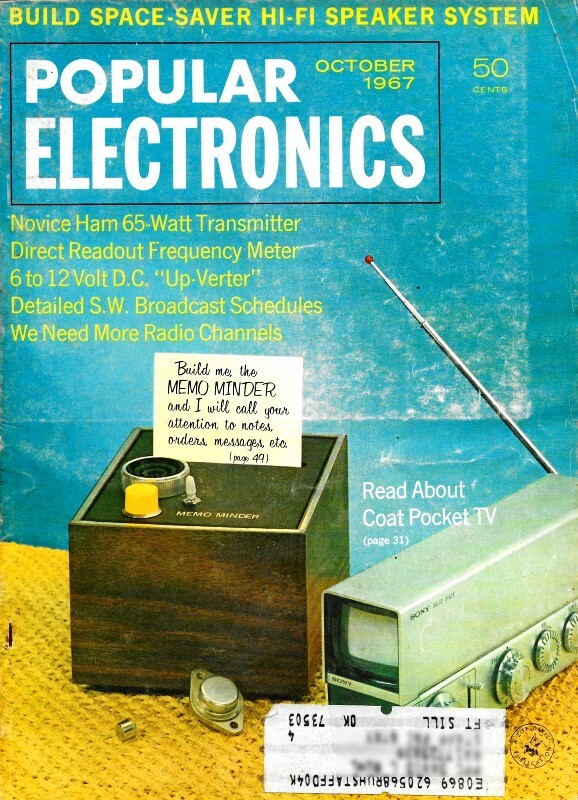 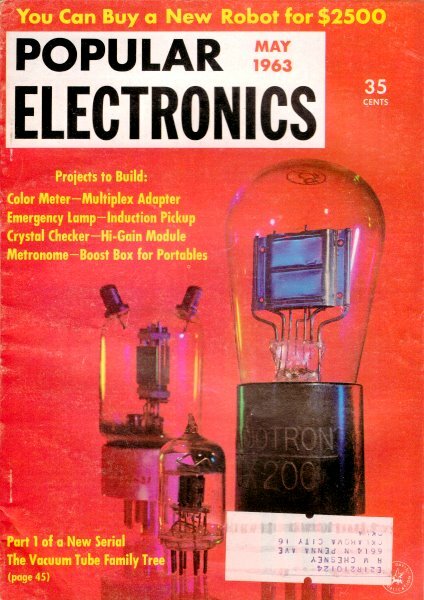 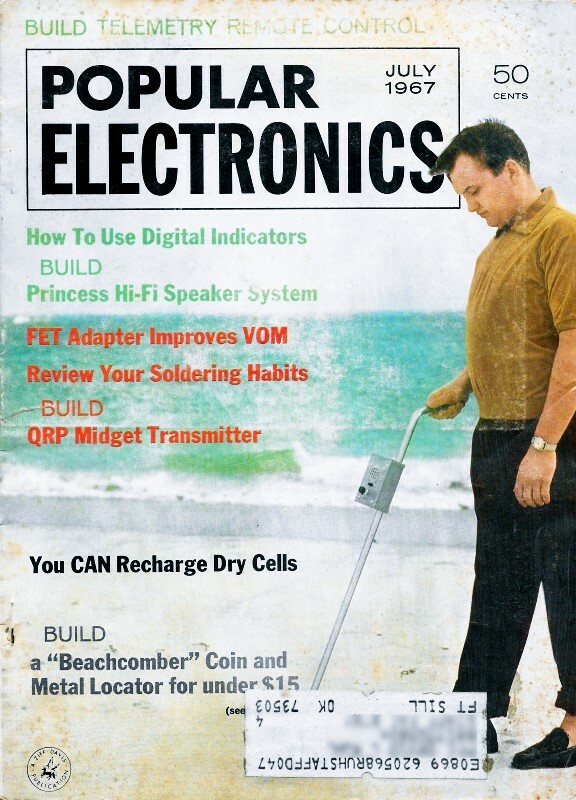 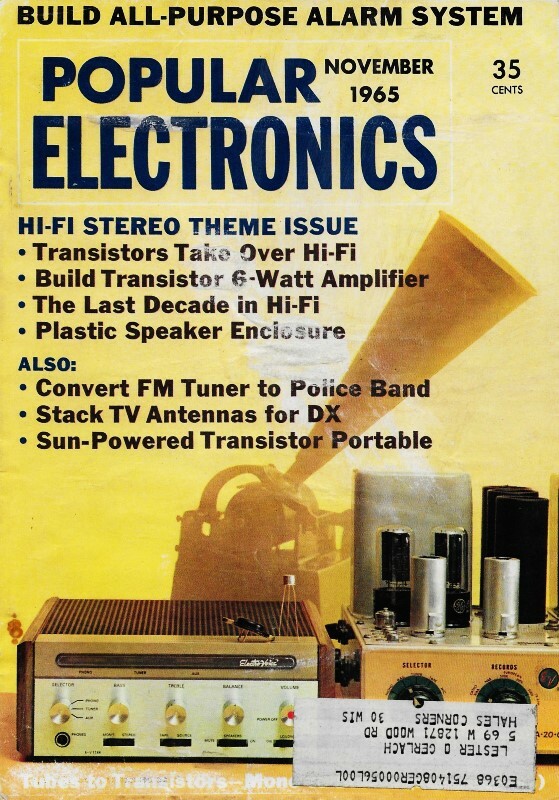 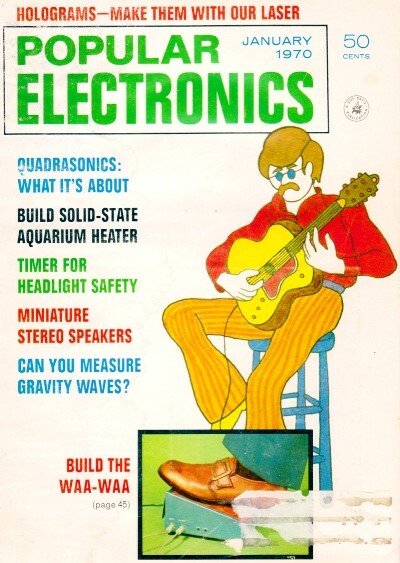 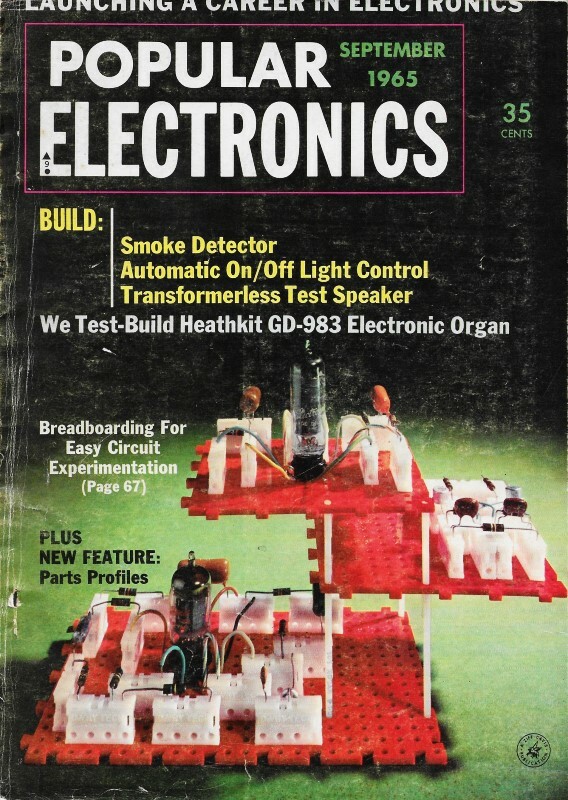 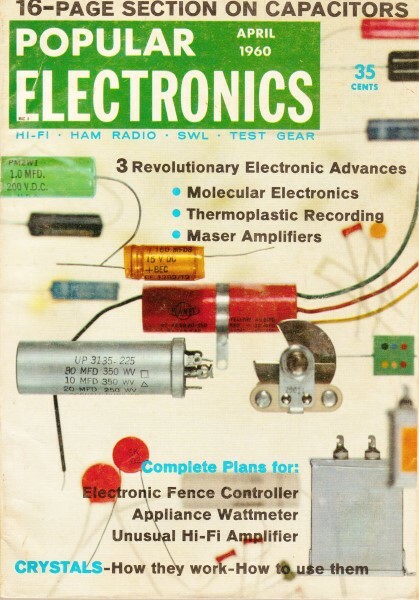 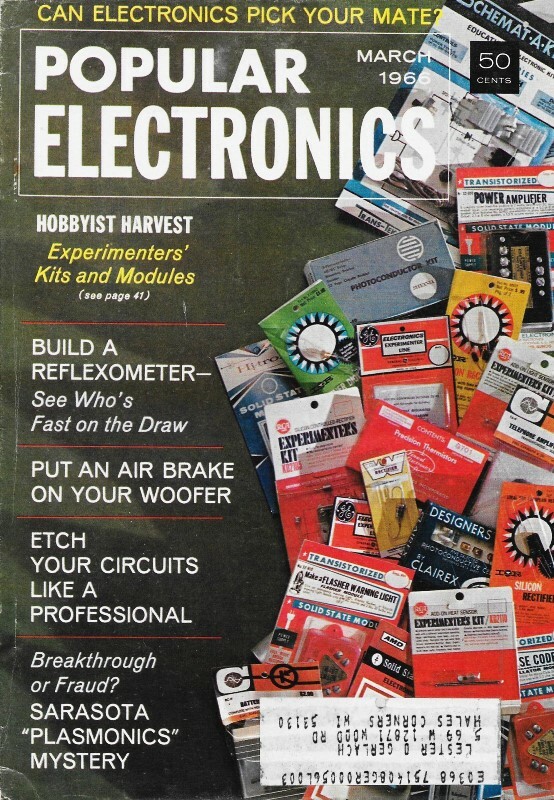 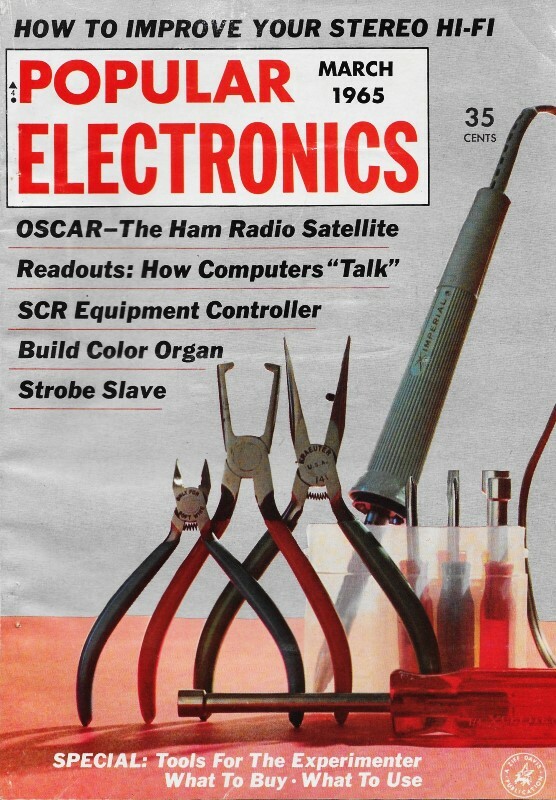 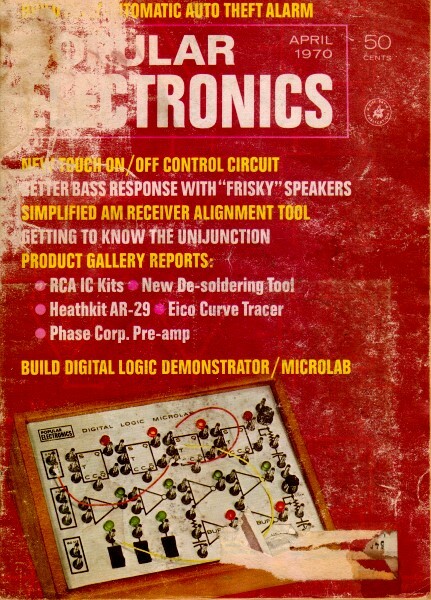 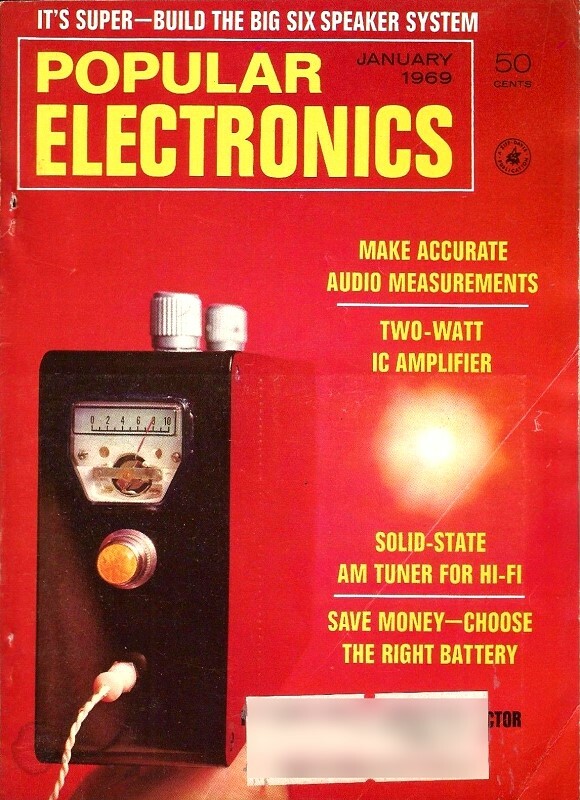 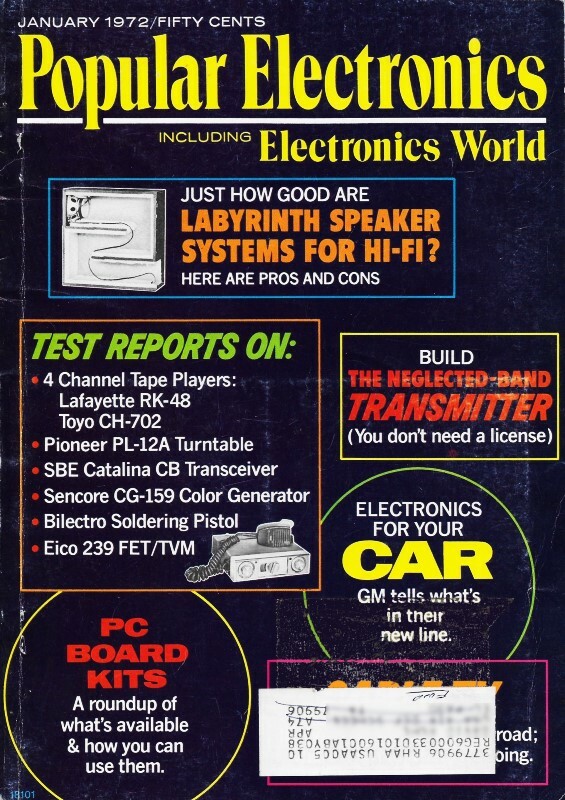 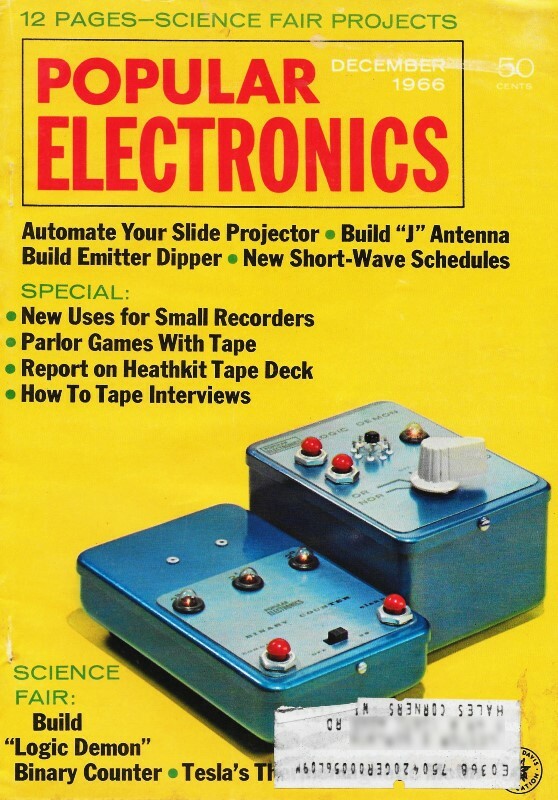 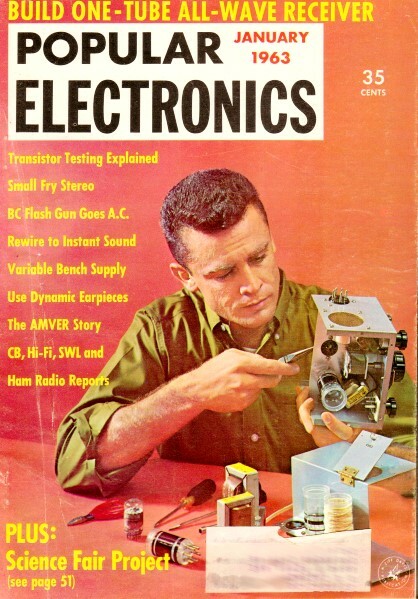 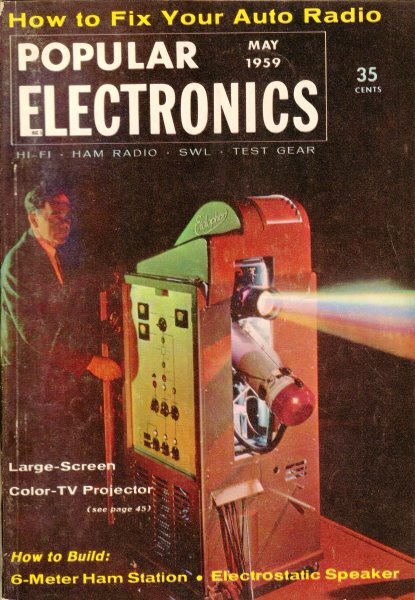 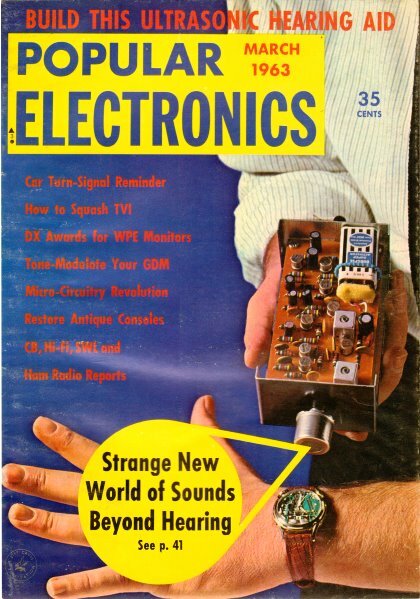 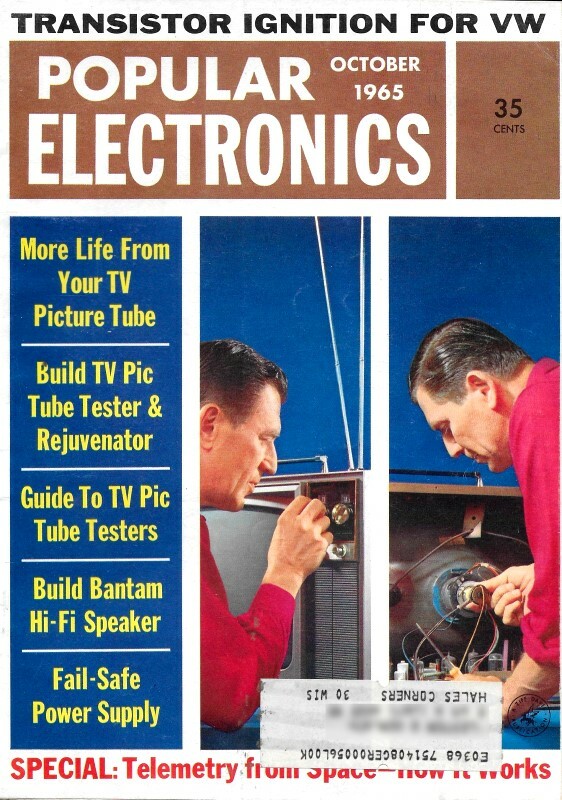 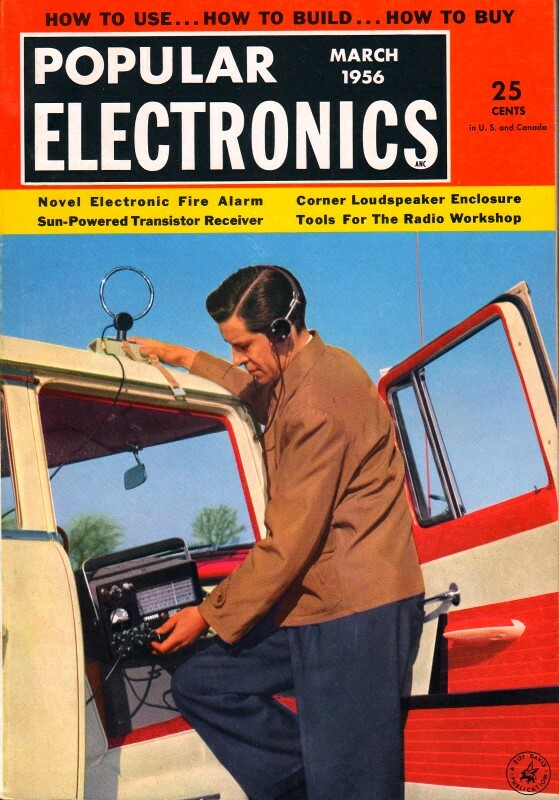 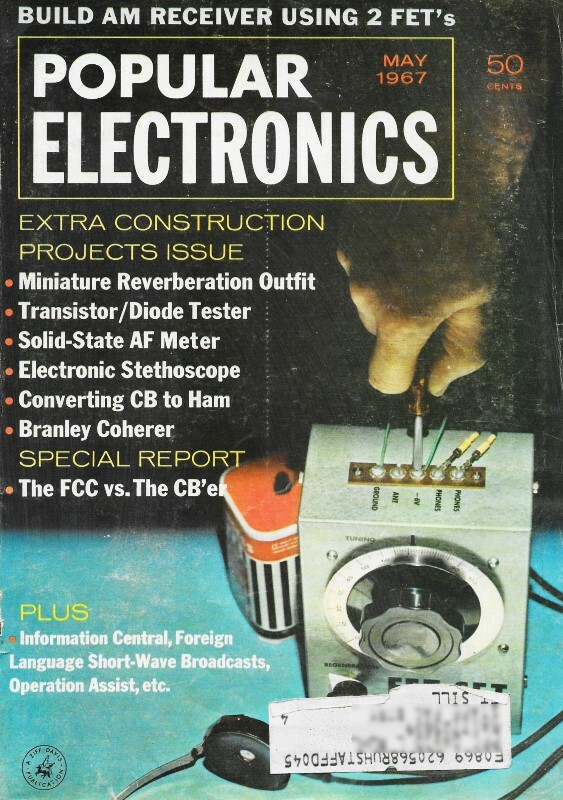 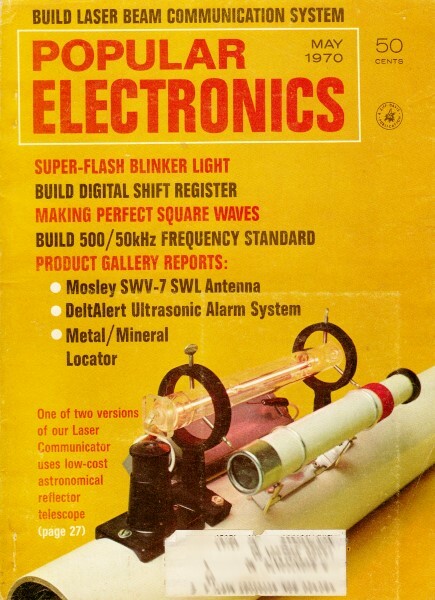 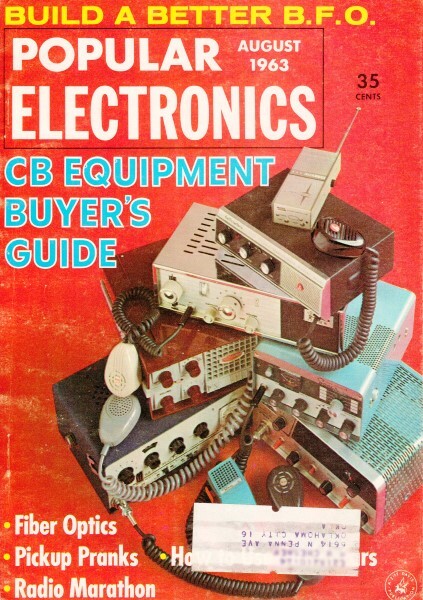 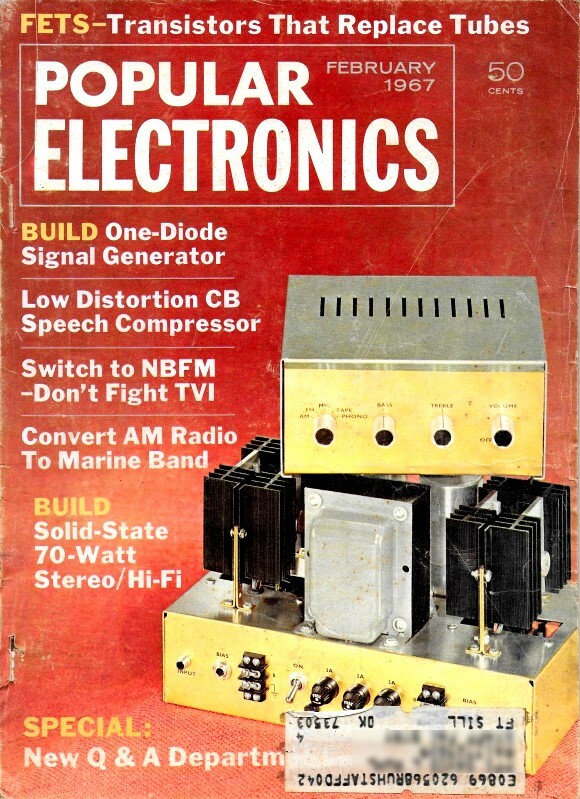 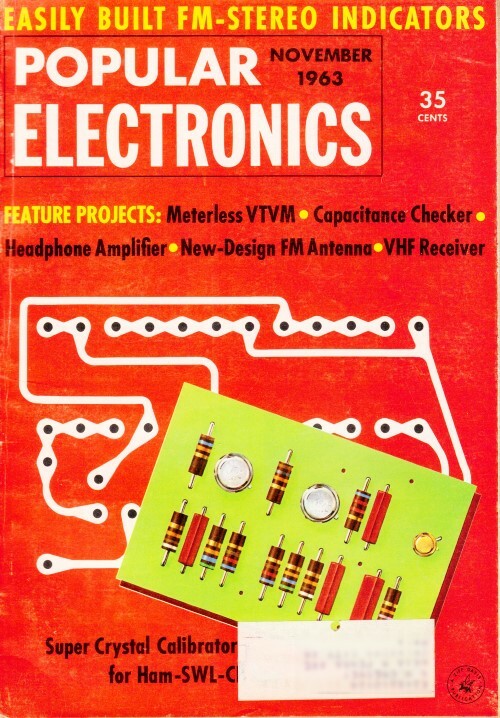 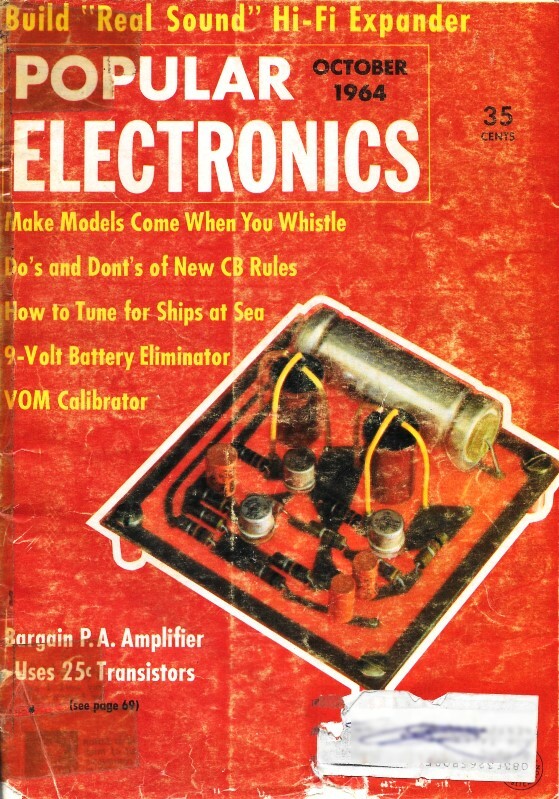 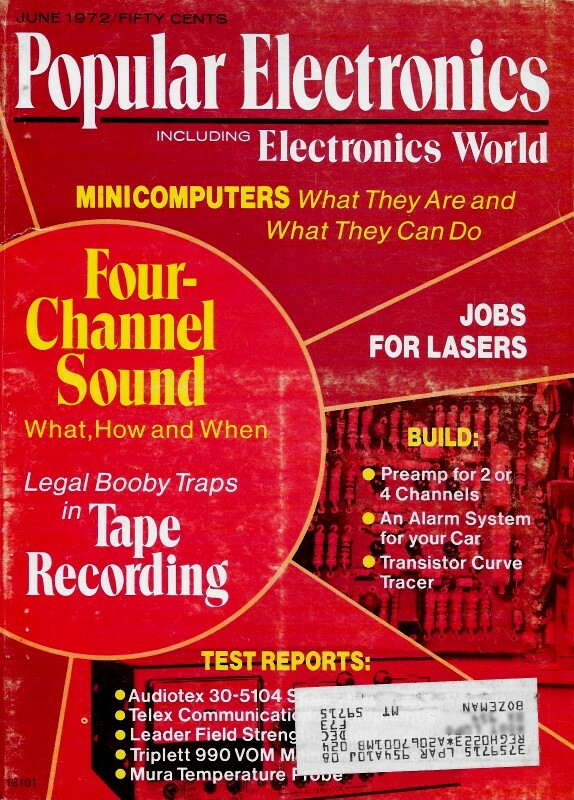 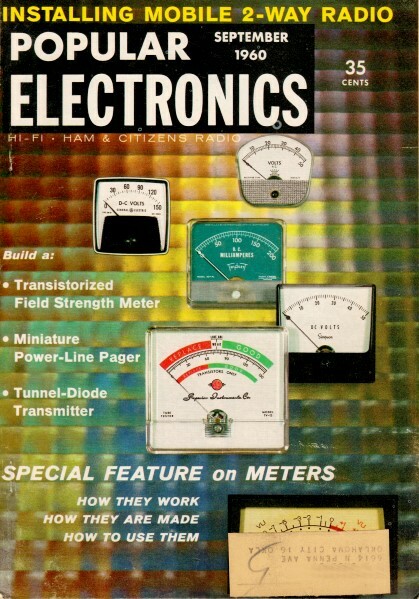 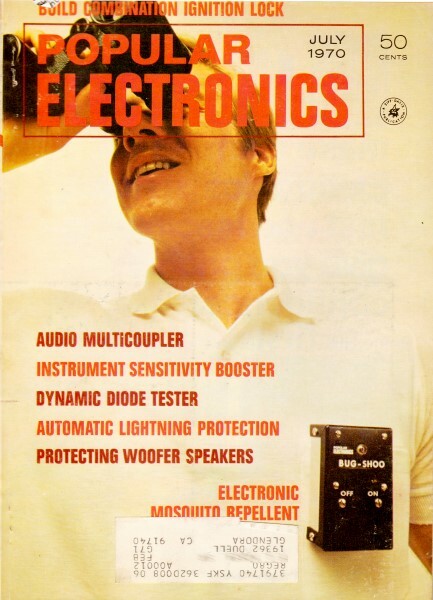 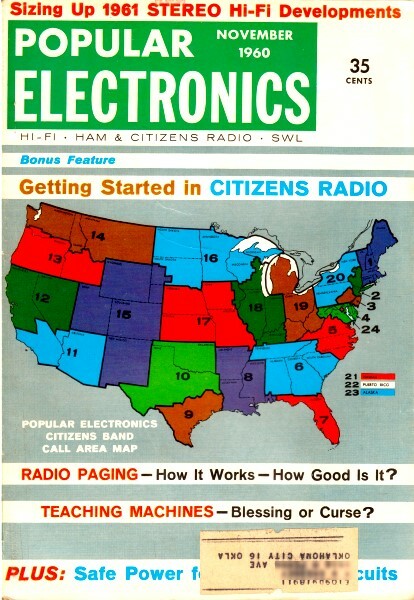 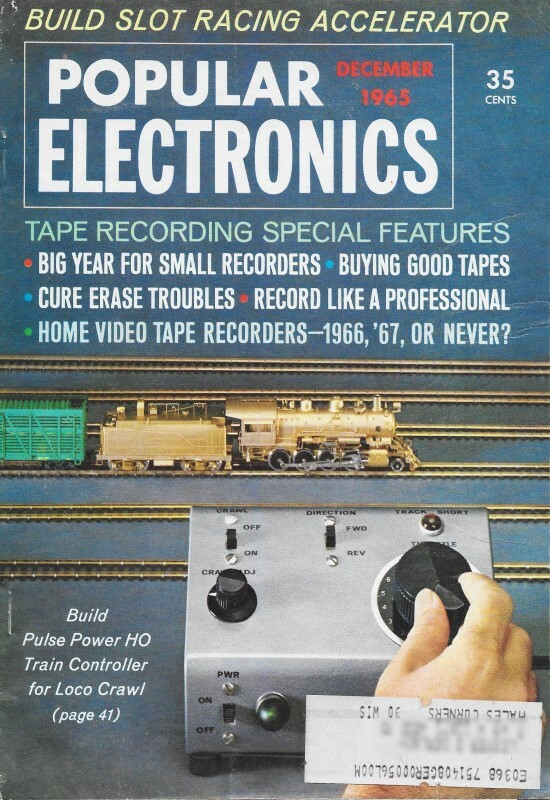 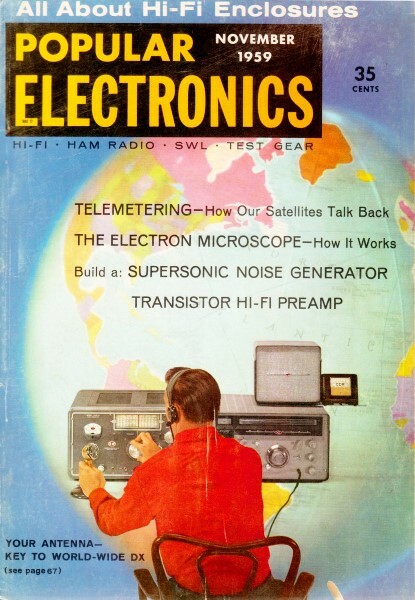 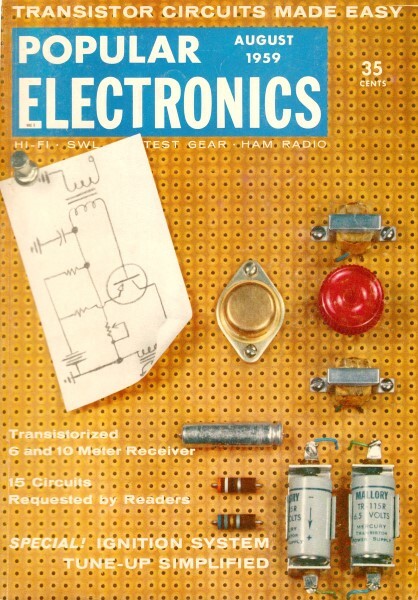 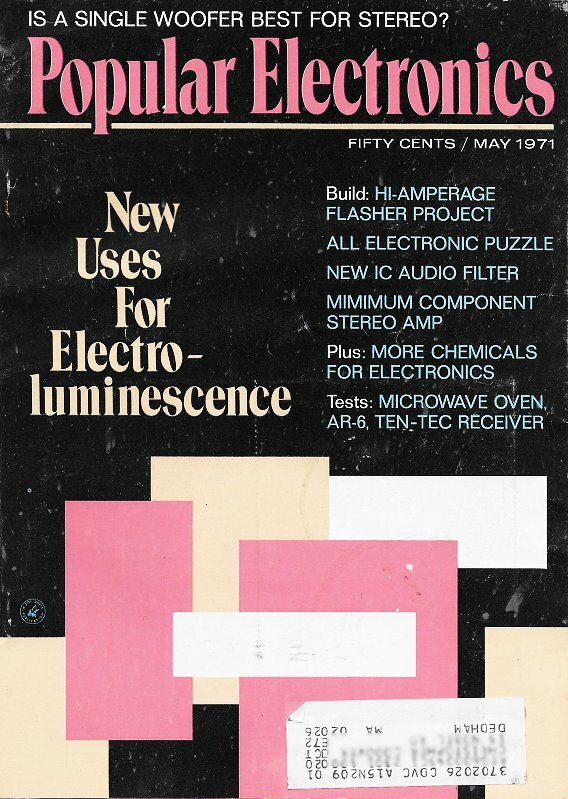 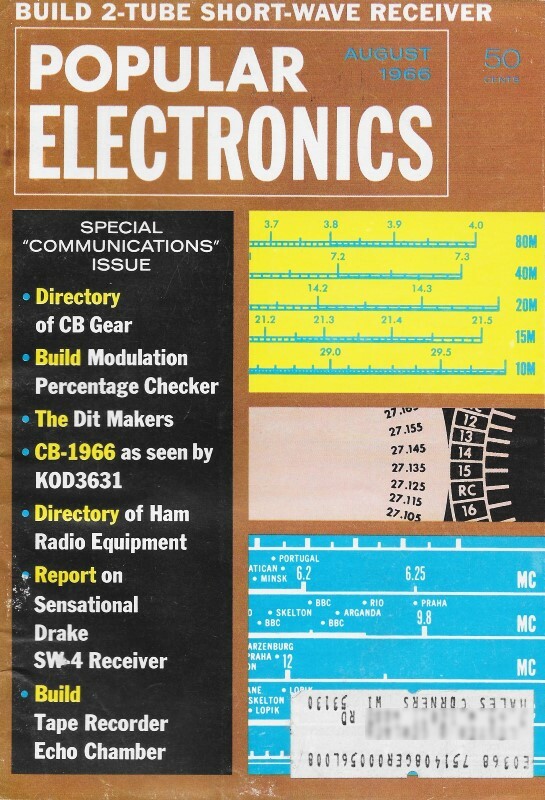 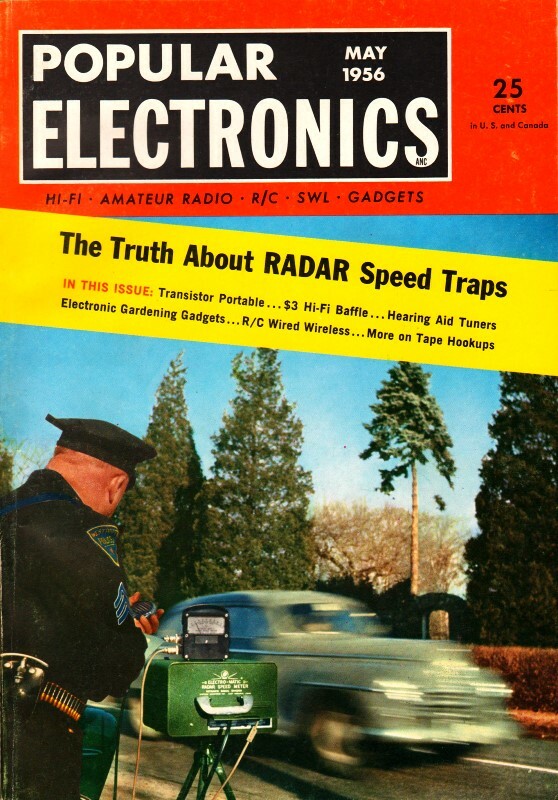 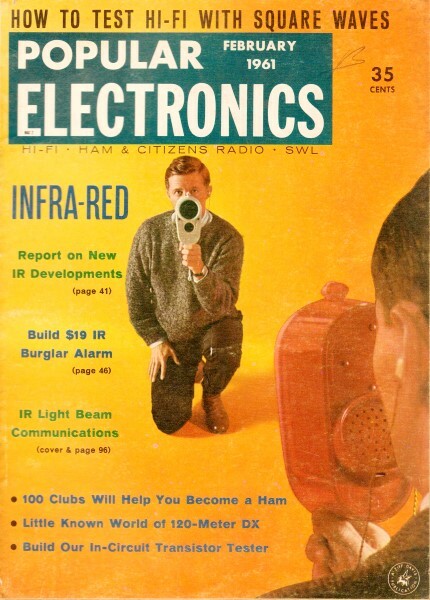 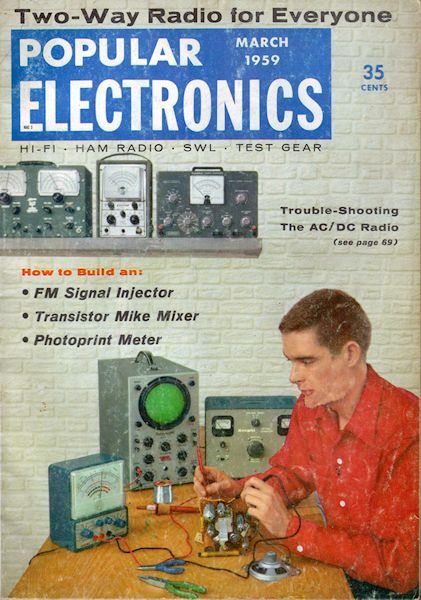 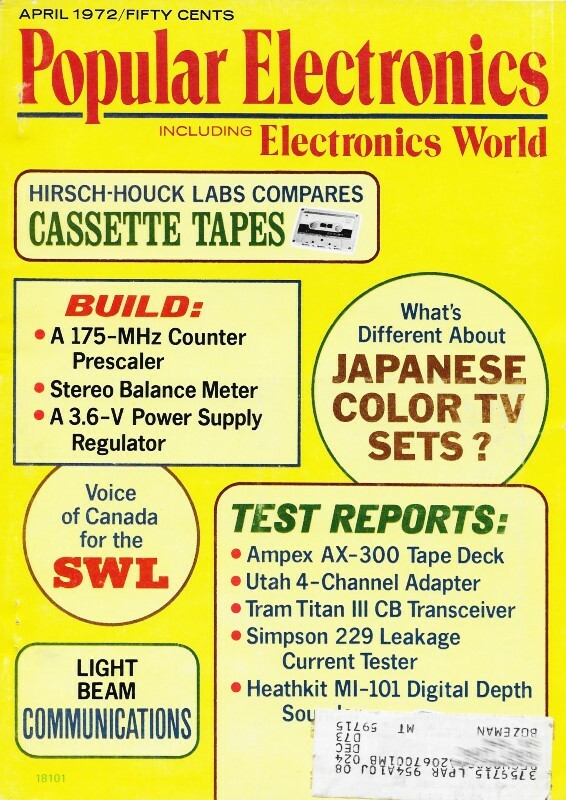 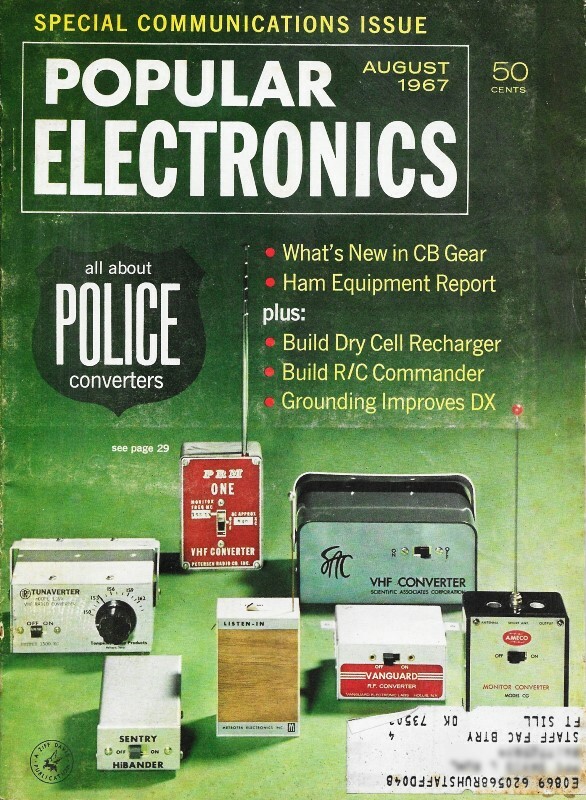 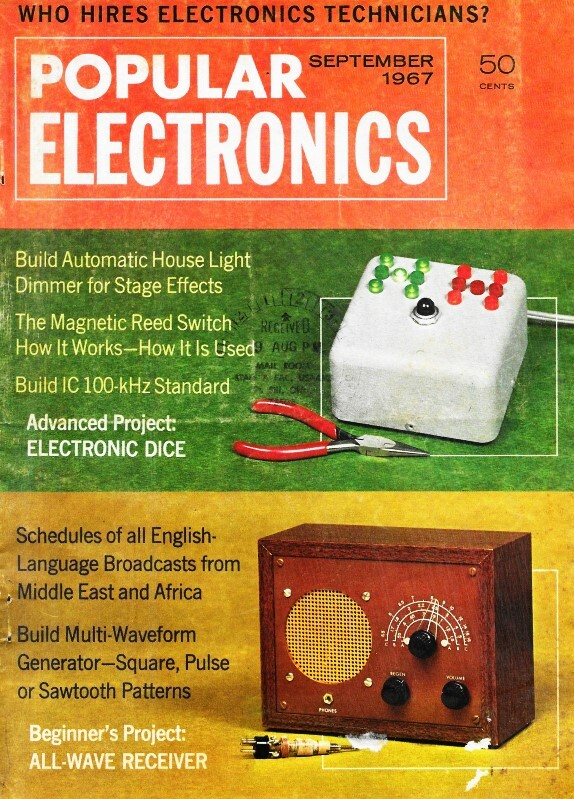 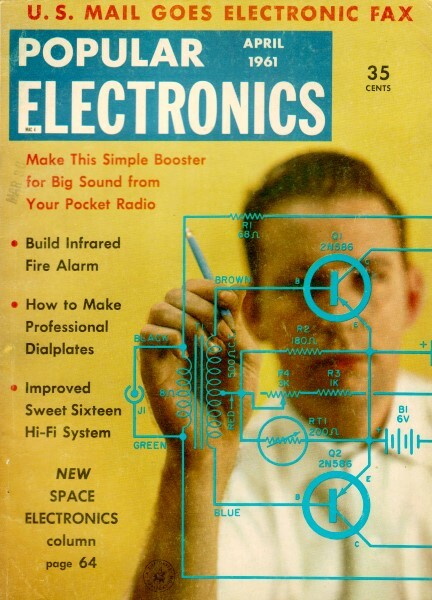 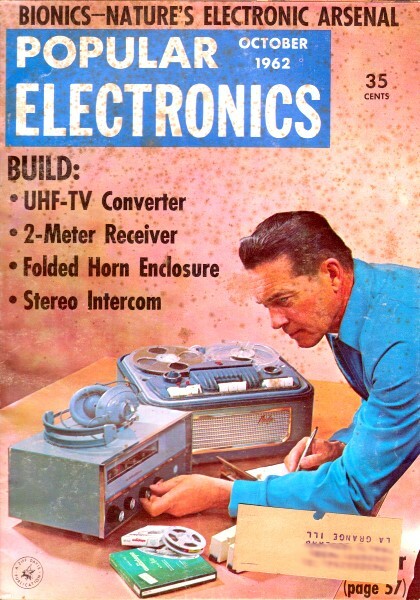 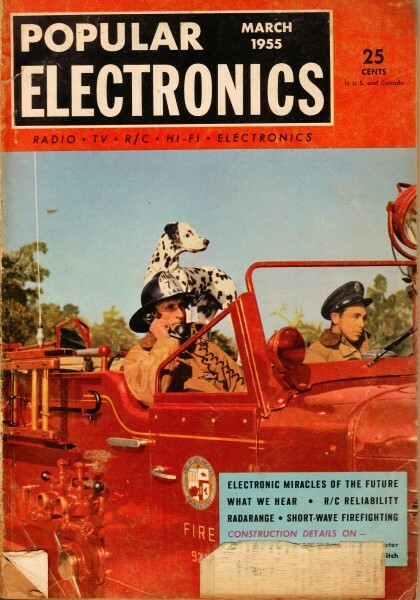 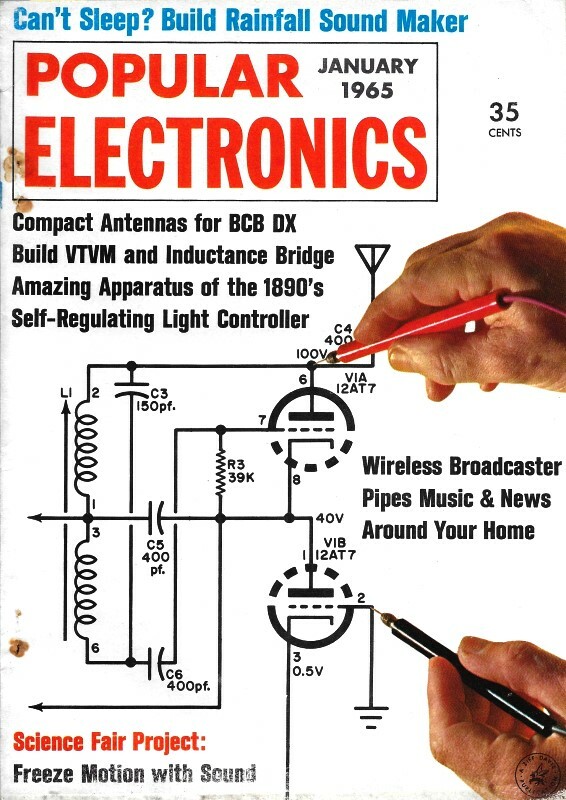 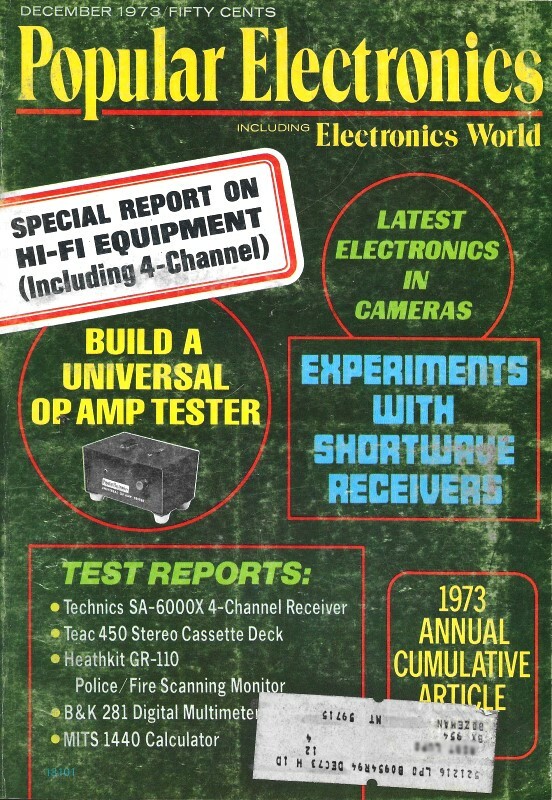 In January 1972, Electronics World magazine was combined with Popular Electronics. 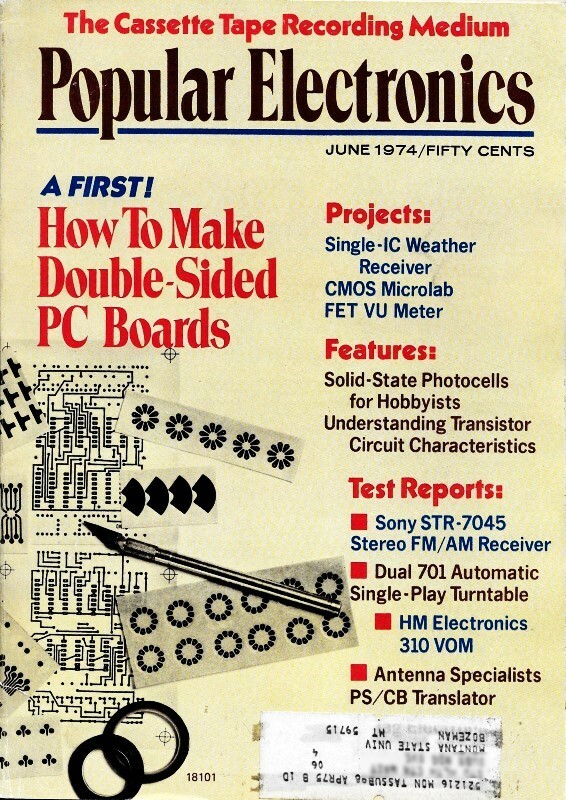 For all of the articles posted a page is created with a cover image and the table of contents. 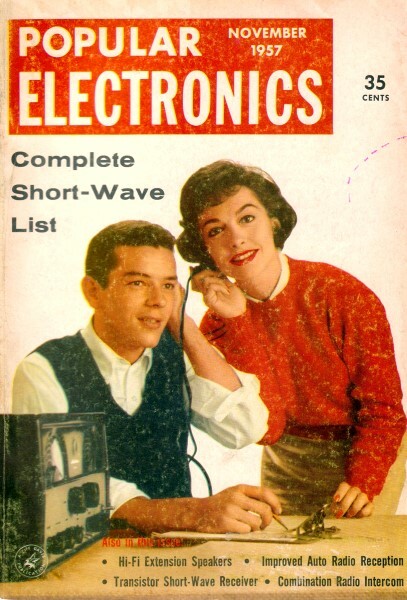 All copyrights are hereby acknowledged. 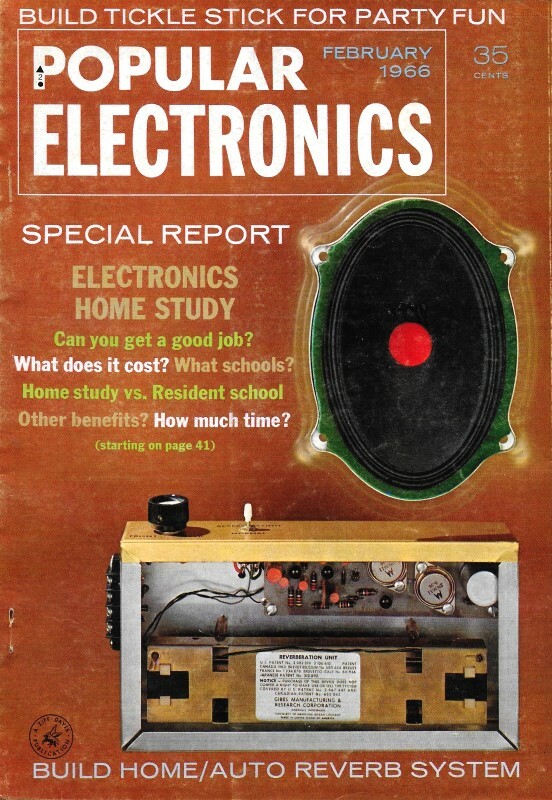 There are 571 articles posted as of November 13, 2018. 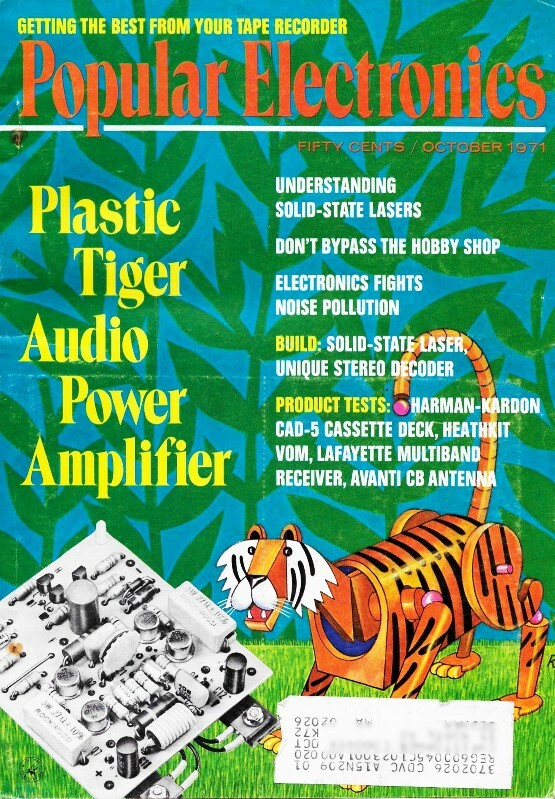 Can We Stave off Radio-Frequency Super-Saturation? 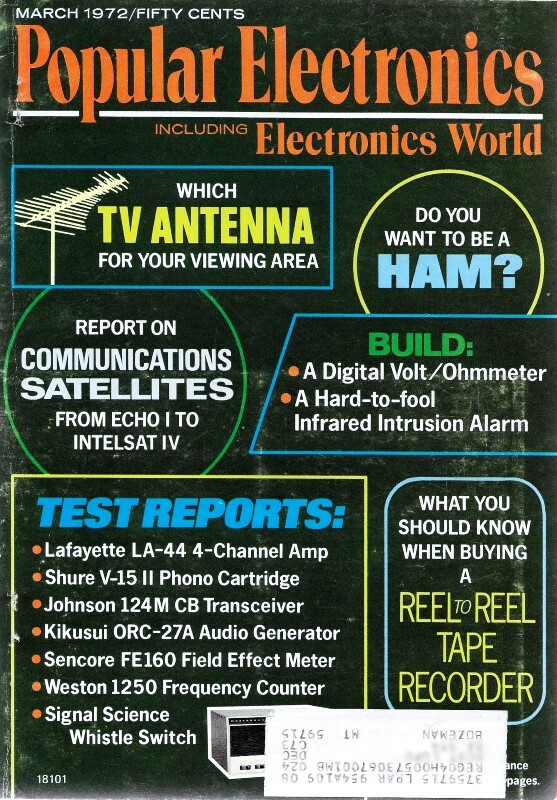 Why Not a Ham License Just for Ladies? 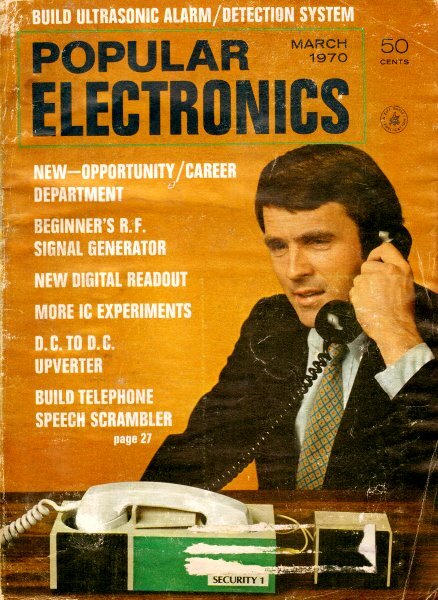 The "Chip" ... Will It Make or Break Your Job Future? 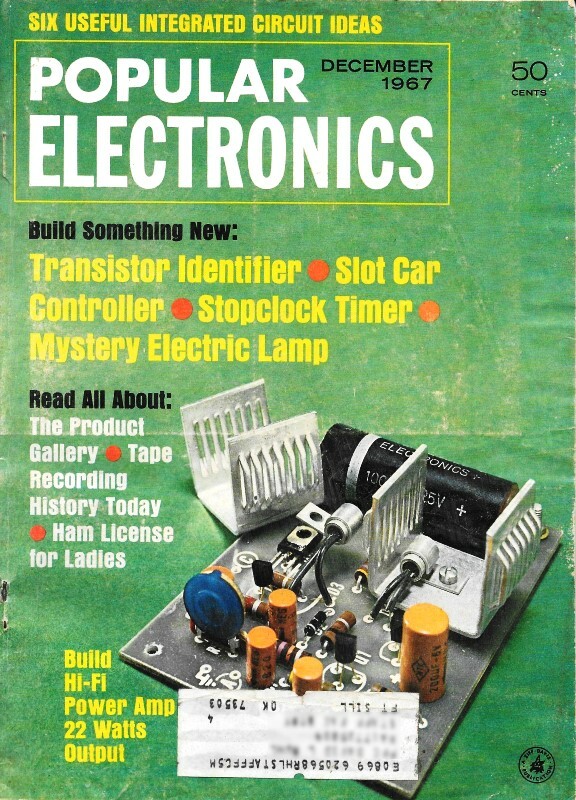 Electronic Soldering: Do You Make Good Connections the First Time, Every Time? 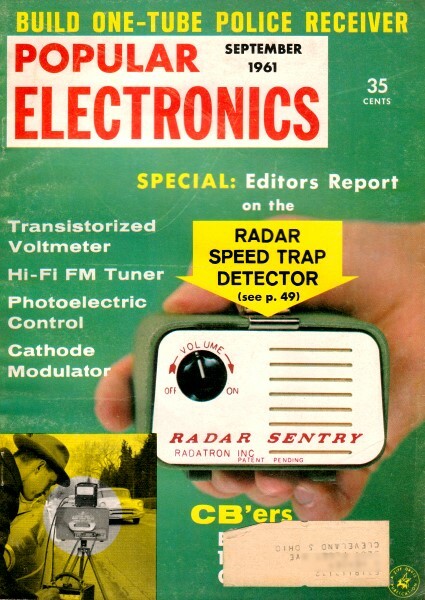 Are Modern Military Radars Infallible? 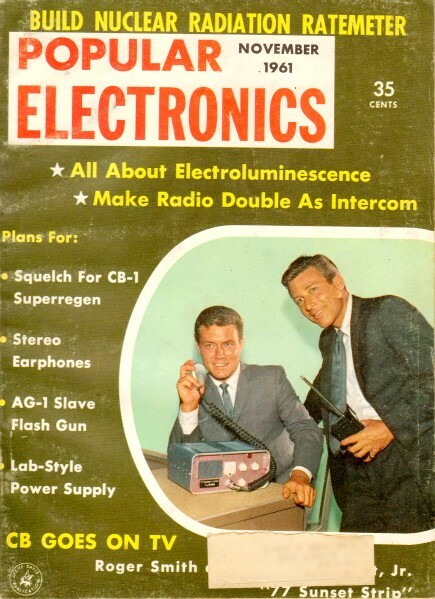 Comes the Revolution - or - "40 Million Frenchmen Can't Be Wrong"
Can Dry Cells Be Recharged? 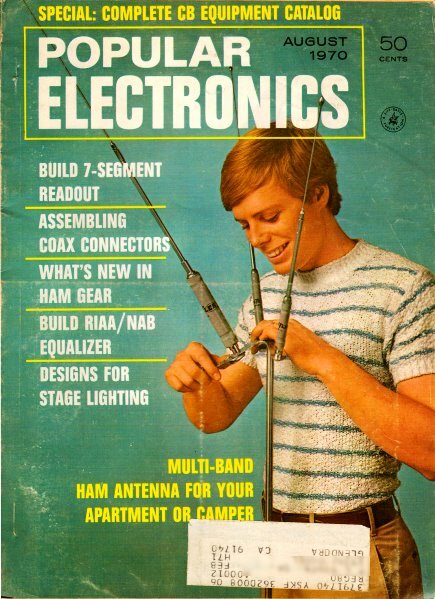 Antenna Placement Does Make a Difference! 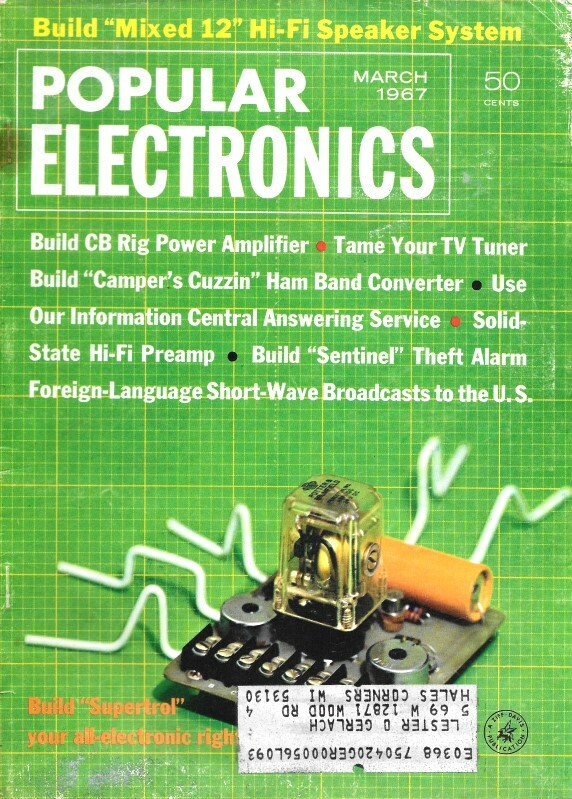 Do You Know Your DC Circuits? 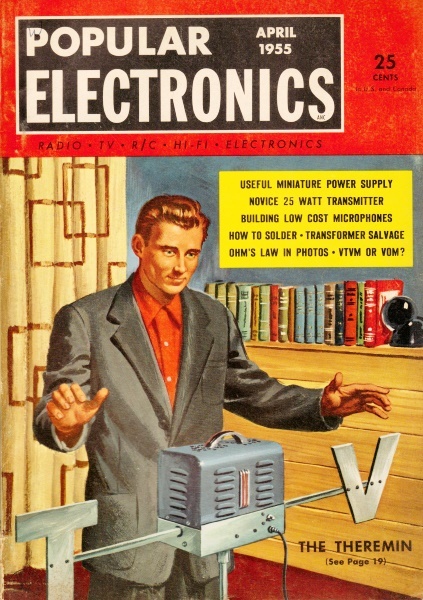 Volta and His "Electric Pile"
What Are All Those Extra Components For? 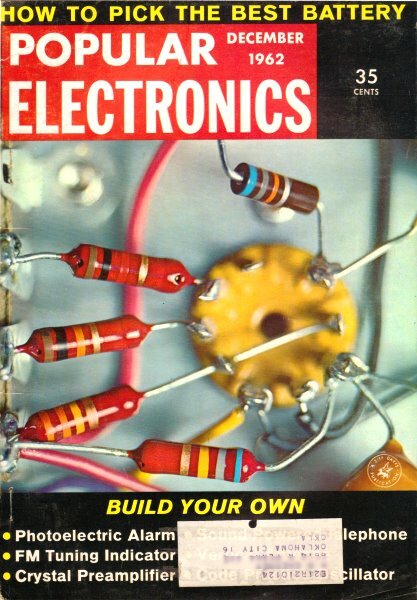 What Do You Know About Resistors? 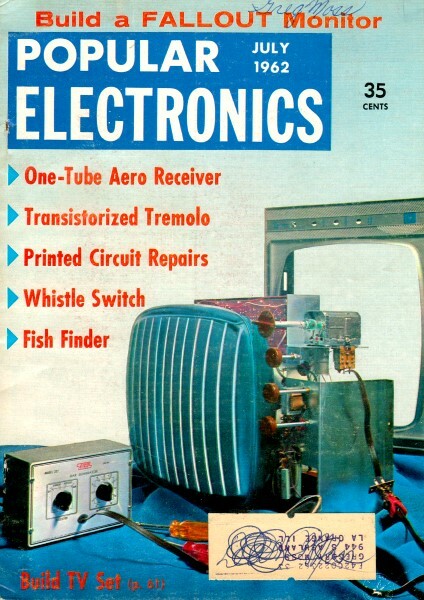 TV Show features "Wires and Pliers"
Simplified Radar to Use "Wamoscope"
Submarines - Are We Open to Sneak Attack? 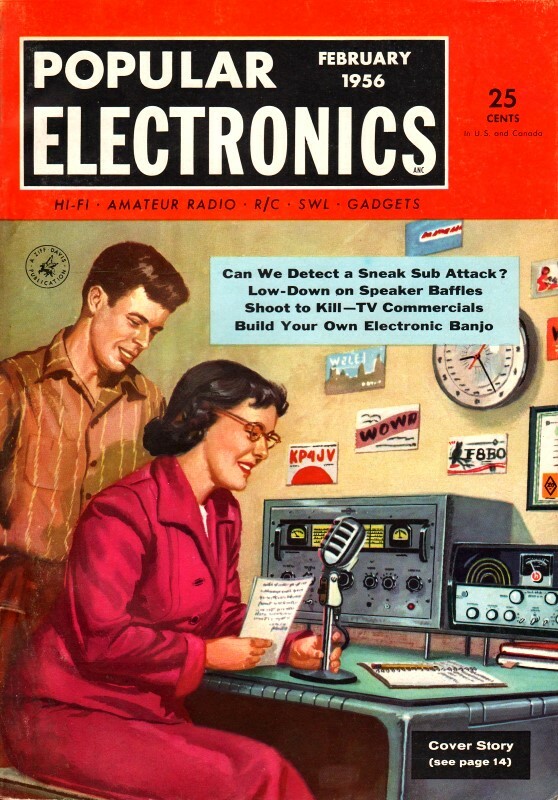 Carl & Jerry: Abetting or Not? 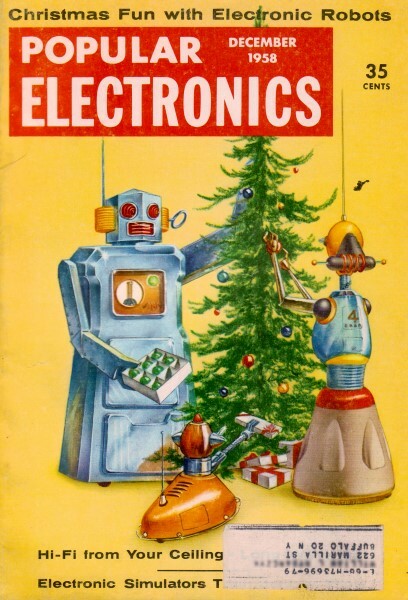 Carl & Jerry: "All's Fair --"
Carl & Jerry: He Went That-a-Way! 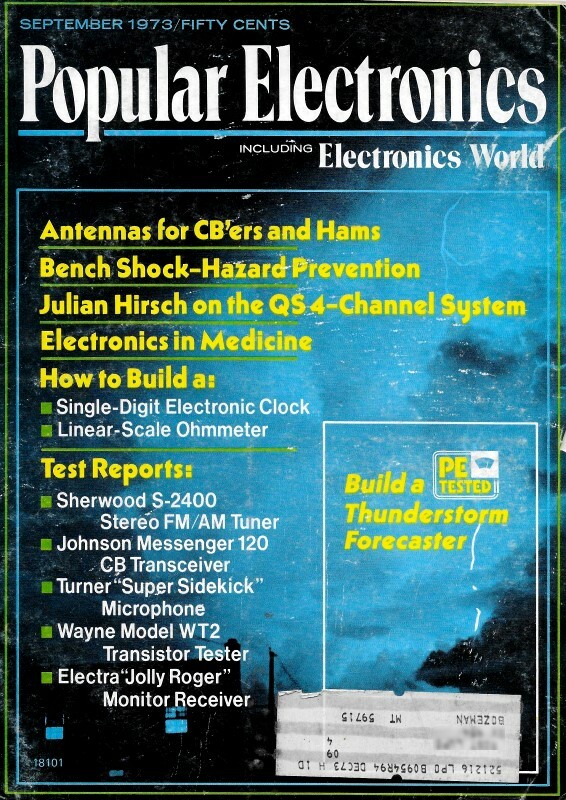 Quiz: Resistive? 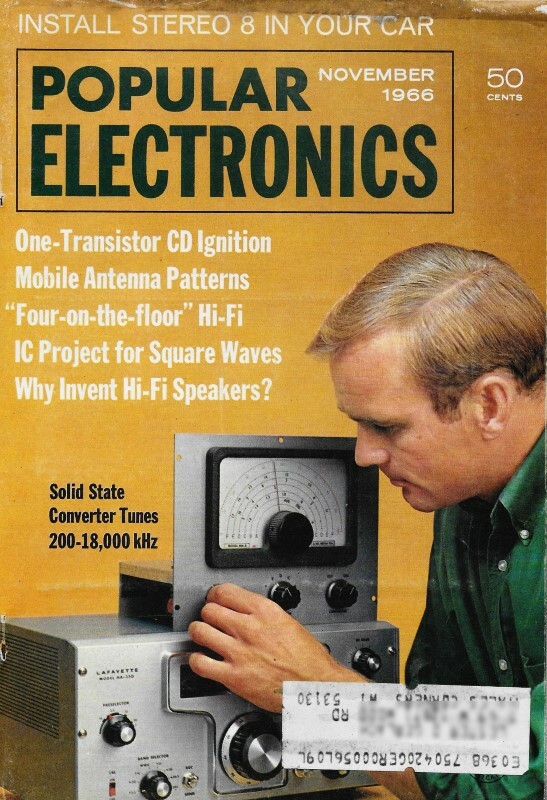 Inductive? 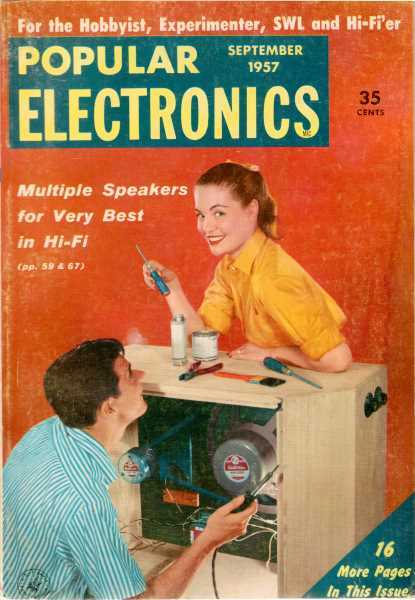 or Capacitive? 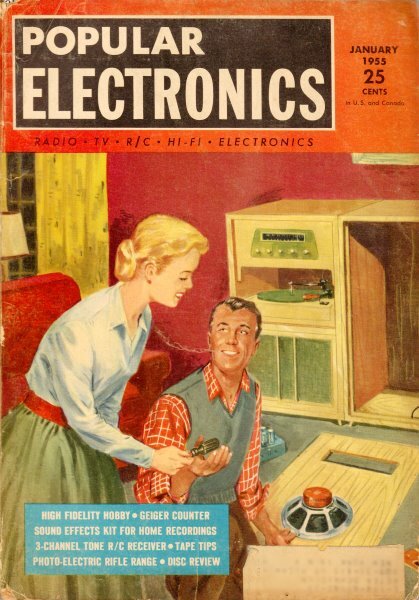 Will You Pay For TV? 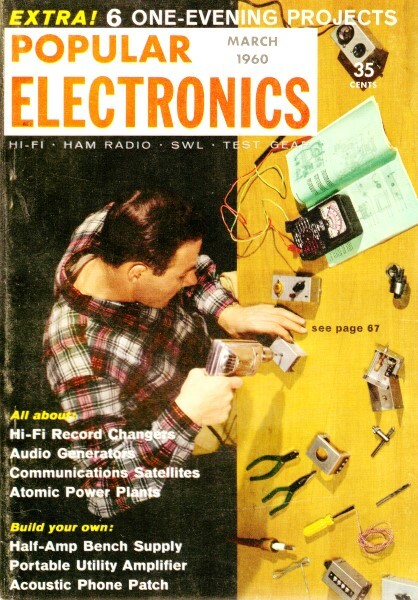 After Class: What is a Servomechanism? 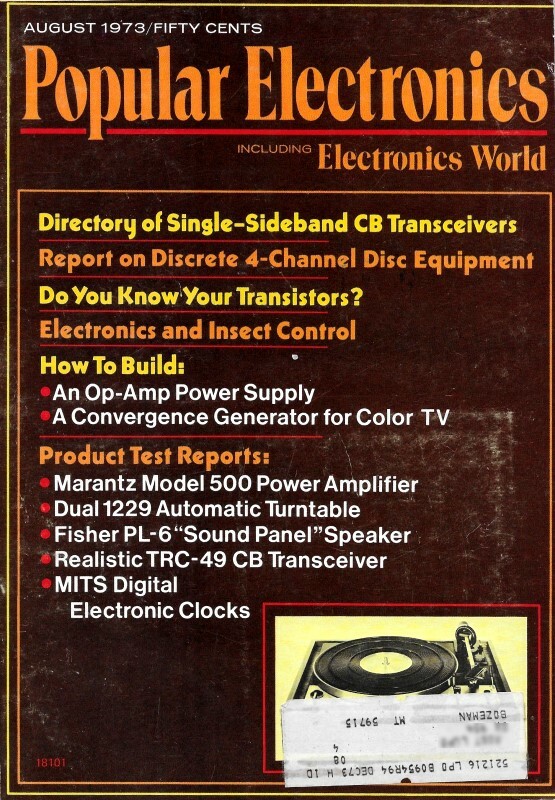 LSI Gives Semiconductors a "Trip"
A TV Tube: As It Is Made - In Germany - In U.S.A.
What is an Audio Watt? 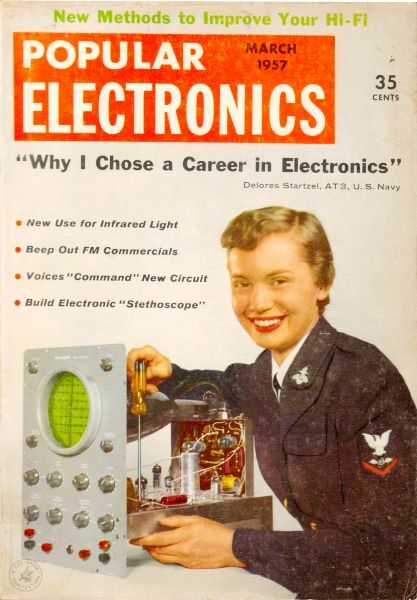 How Far Can You Go in Electronics Without a Degree? 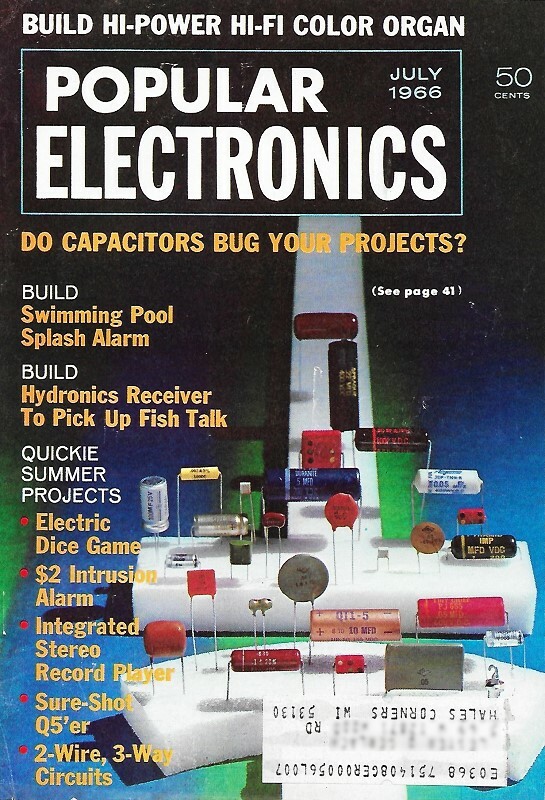 A Primer on Capacitors - What Is a Capacitor?